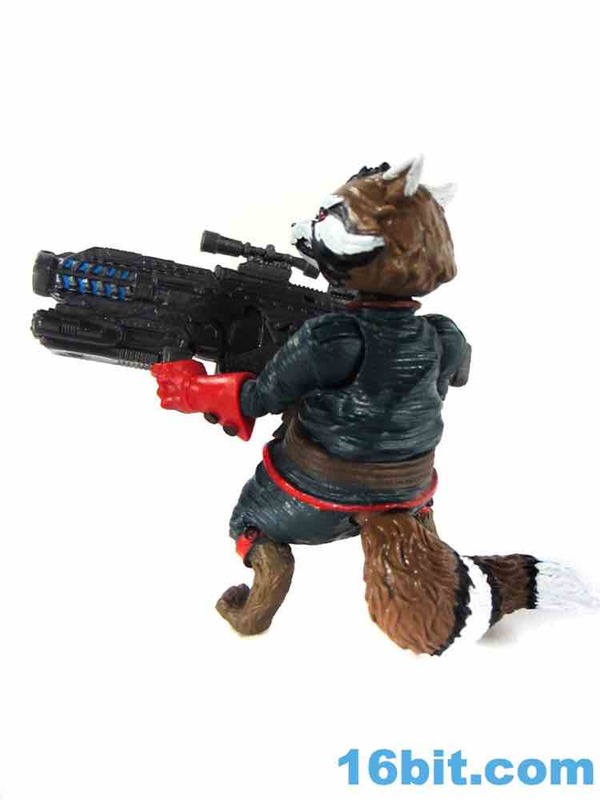 On occasion at work I get to be involved with the creation, approval, and (at times) development/changing of toy exclusives. 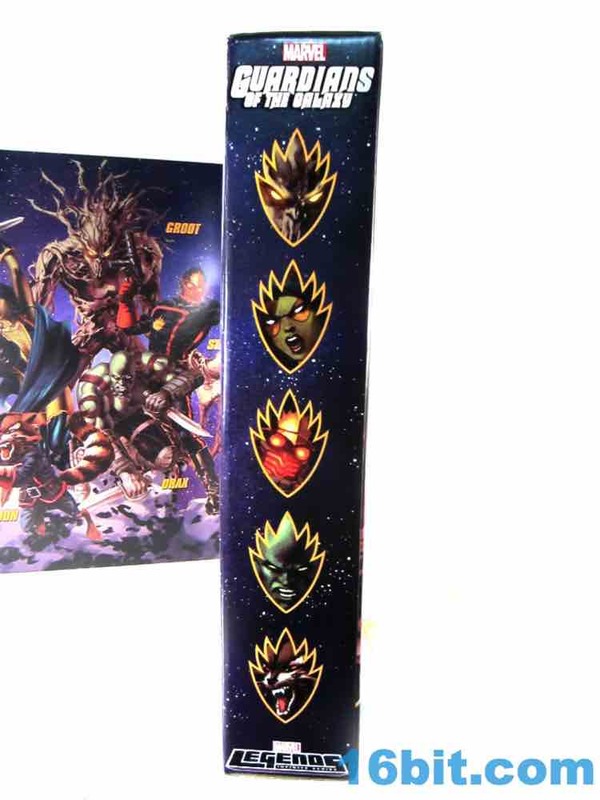 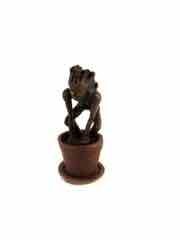 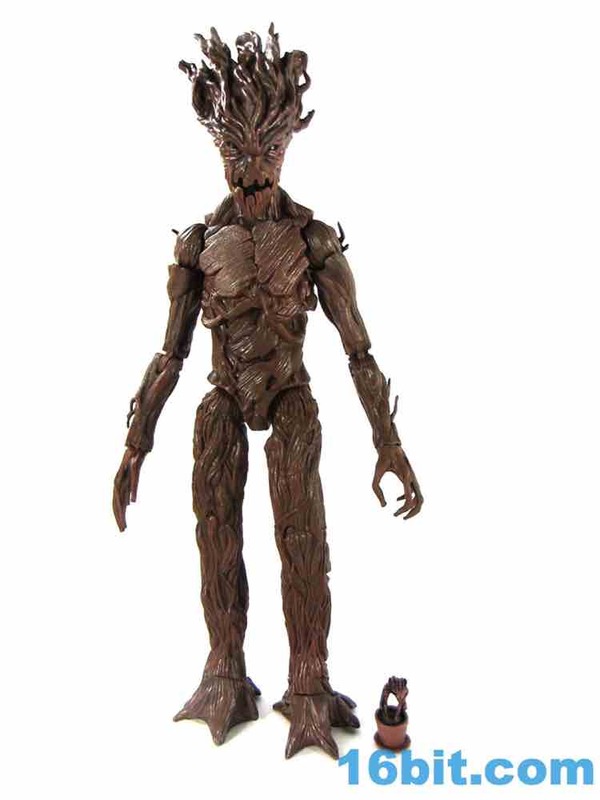 The Guardians of the Galaxy Classic 5-Pack was a solid idea but I wanted a "baby Groot in a flower pot" and well, now there's one in there. 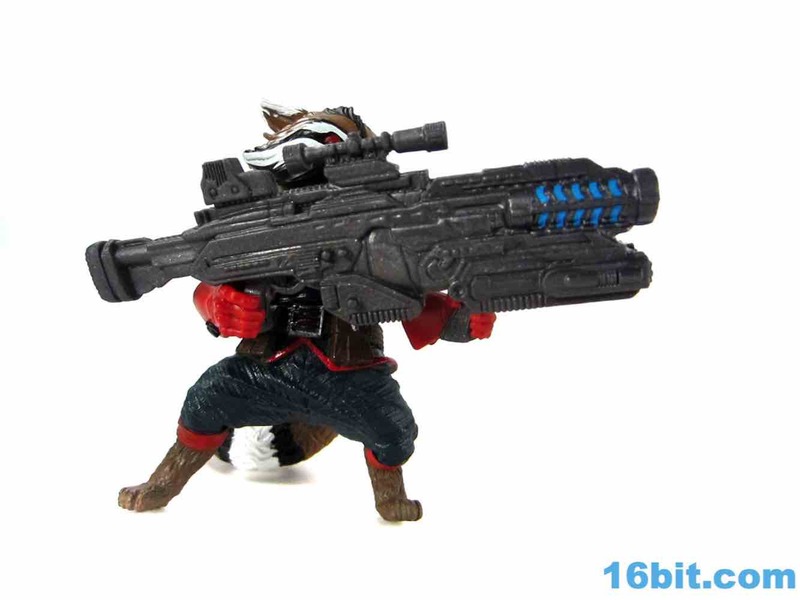 It's not quite a sixth figure, but as accessories go it's a nice bonus to the already packed-with-firepower set - of which I am biased toward liking, hence the previous sentence/conflict of interest/etc. 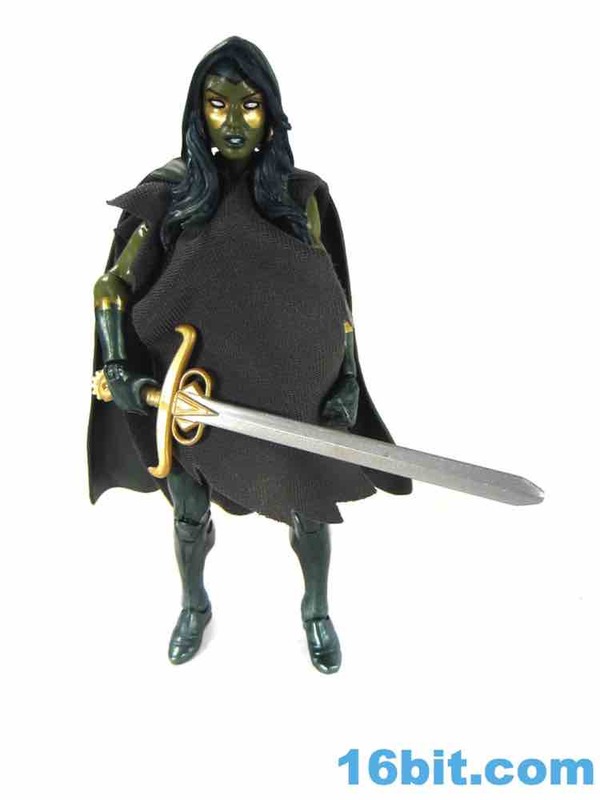 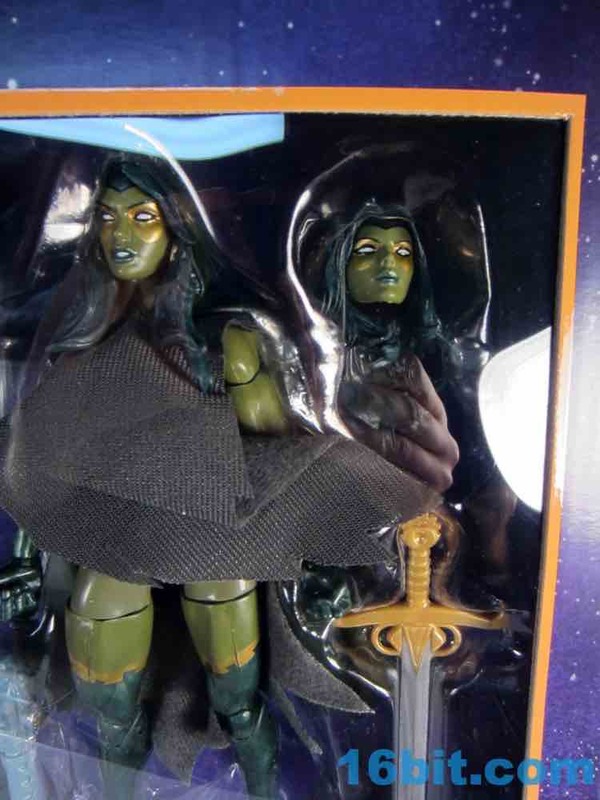 The figures use a few new parts and a few old parts of characters you may have missed before - also this is the first Hasbro comic Gamora figure. 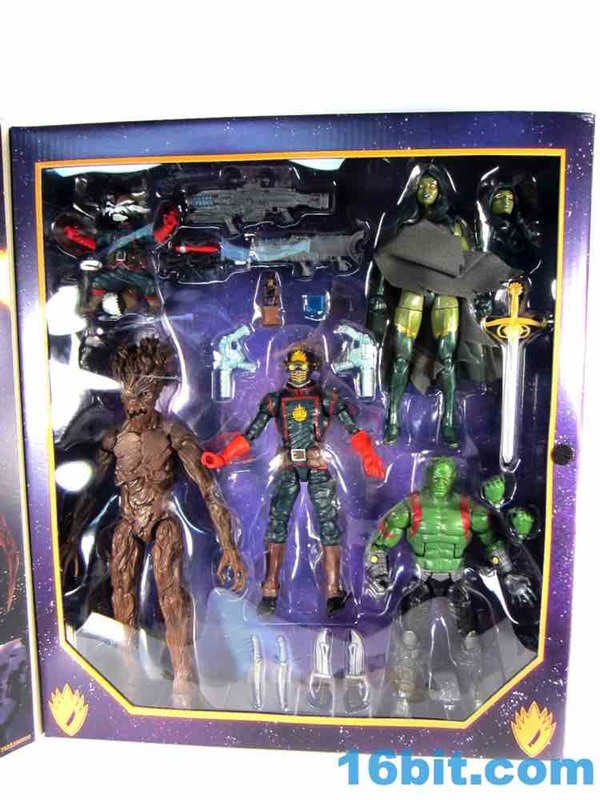 You get a lot of plastic in this one, and as someone who has very few figures from this line (relatively speaking) I like this set a bunch. 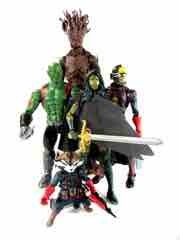 Sure it's not the full comic team - but you know how it is, the movie team, comic forms, synergy, all that jazz. 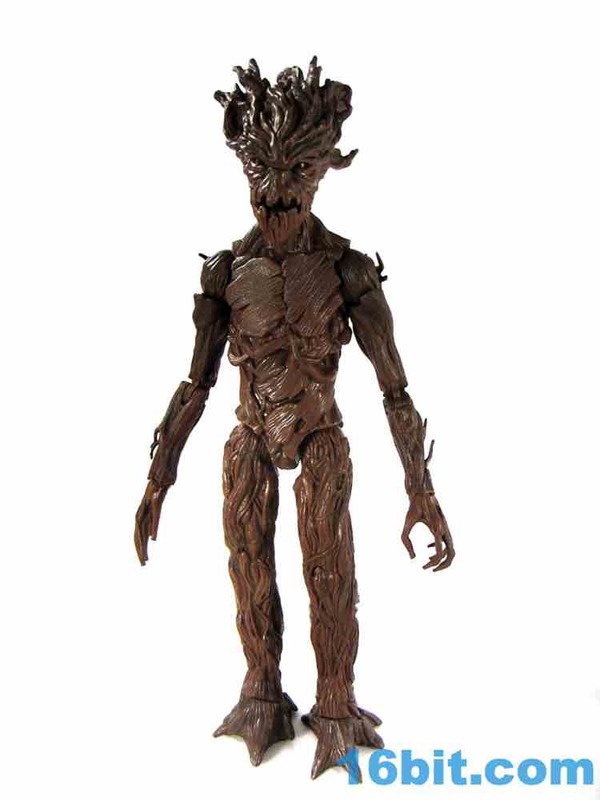 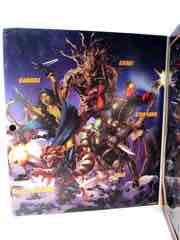 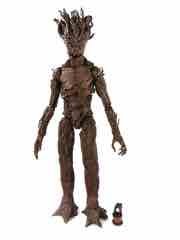 First up is the first comic Groot in this line, with an all-new head, dark bark, and... otherwise he's basically the same as the Movie Groot build-a-figure. 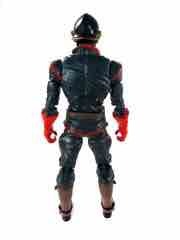 He has double-jointed elbows, bend-and-swivel wrists, rocker ankles, and is basically everything you might want. 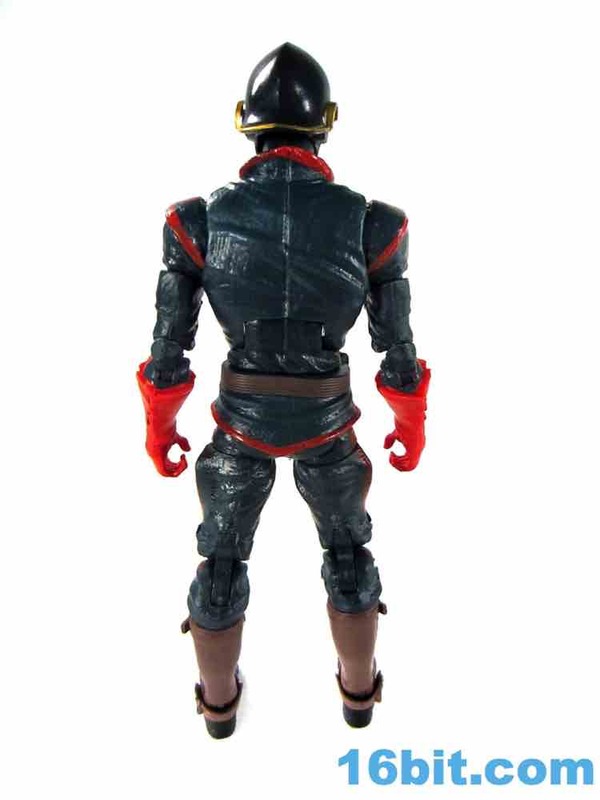 Given how his look in the comics seems to change pretty regularly from artist to artist, a "movie body" is just one more interpretation which doesn't seem particularly better or worse than another option and makes sense as any sort of "we gotta save tooling budgeting" goes. 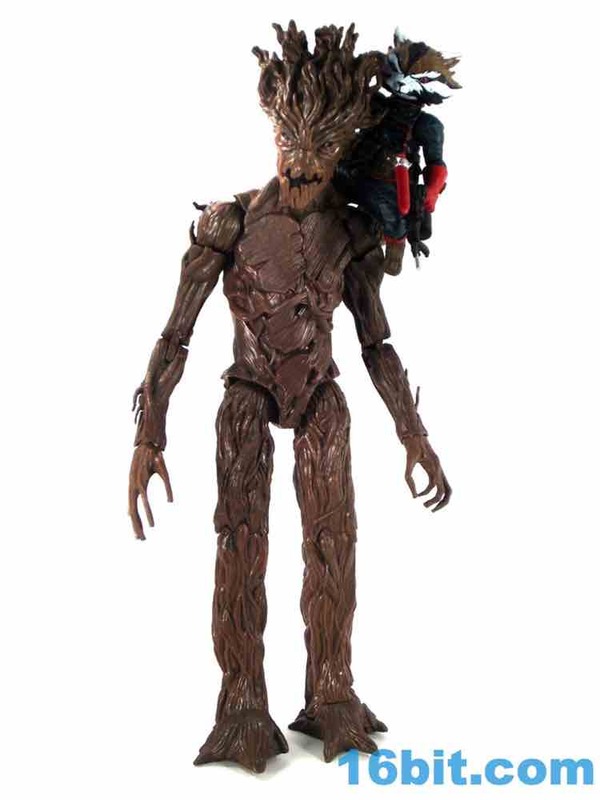 He's a hair under 10-inches tall thanks to his wild, Marge Simpson-esque mane of twigs growing from his head. 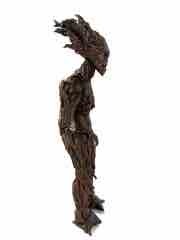 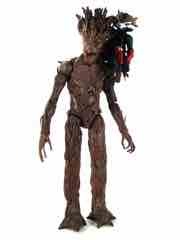 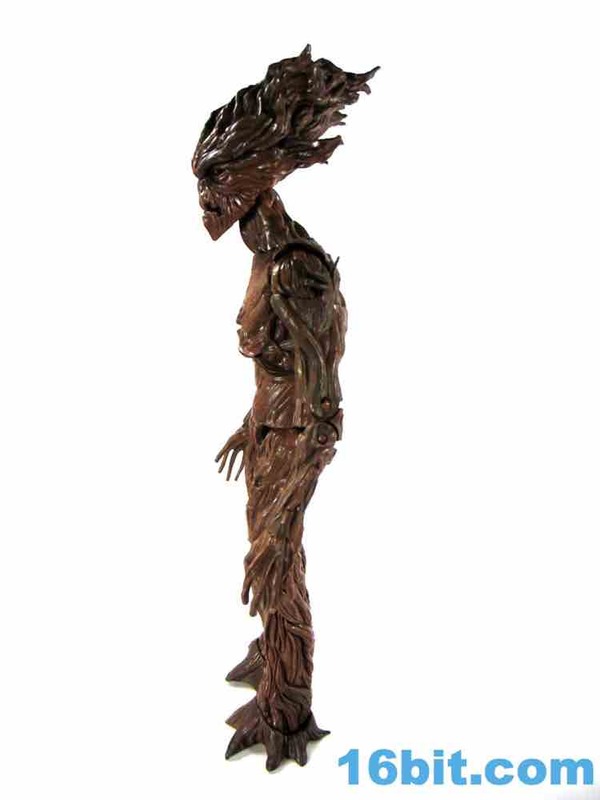 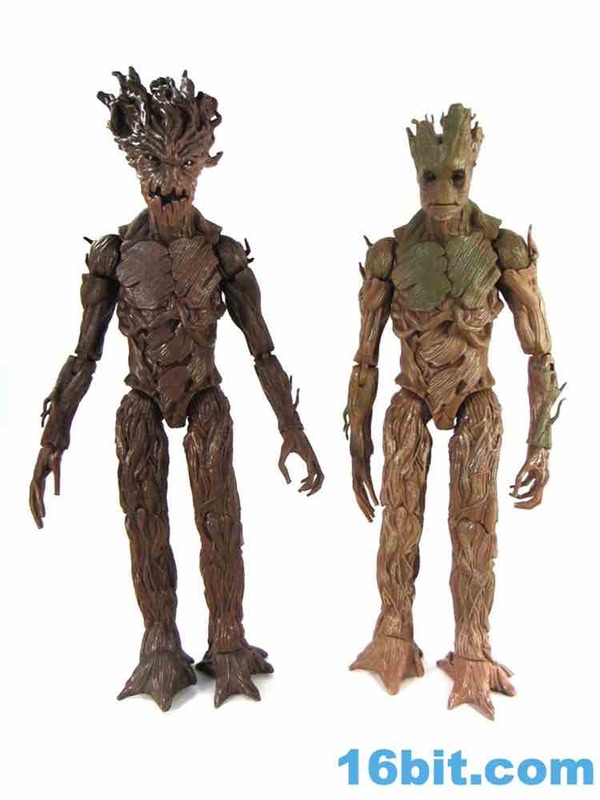 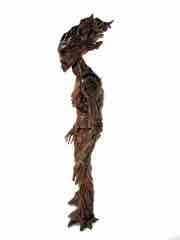 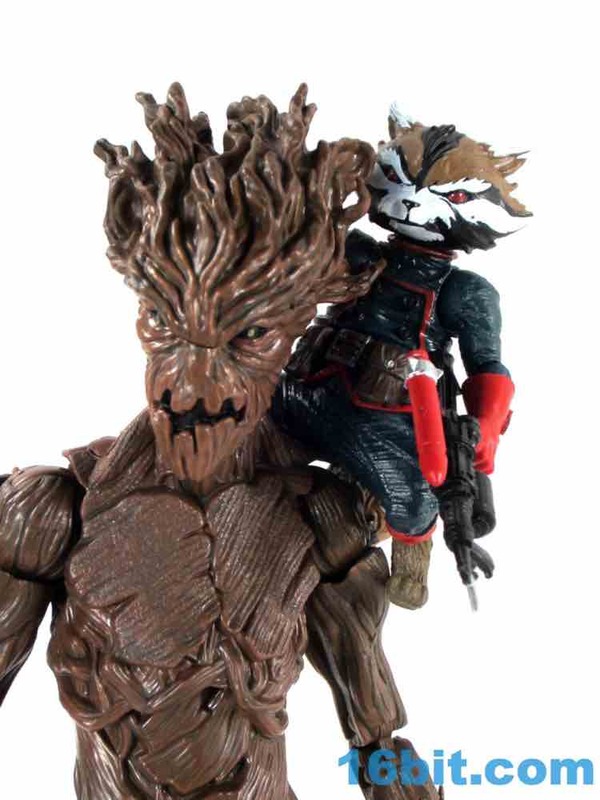 What's really cool about this ratty mass of wood is that there are little offshoots that work as grips for Rocket Raccoon, so he can stand on Groot's shoulders and aim his guns at people. 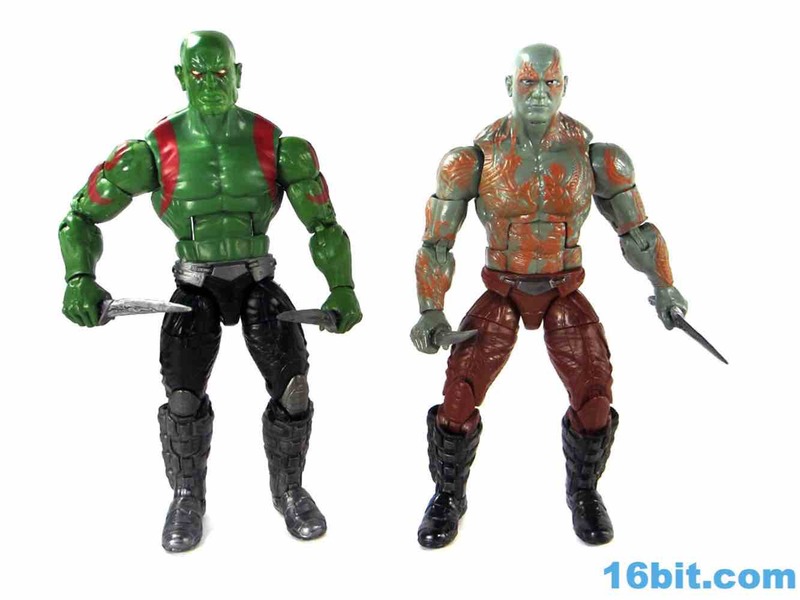 It feels like someone at Hasbro realized that they could do a lot to improve the dynamic between the figures with little effort, and the end result is positive. 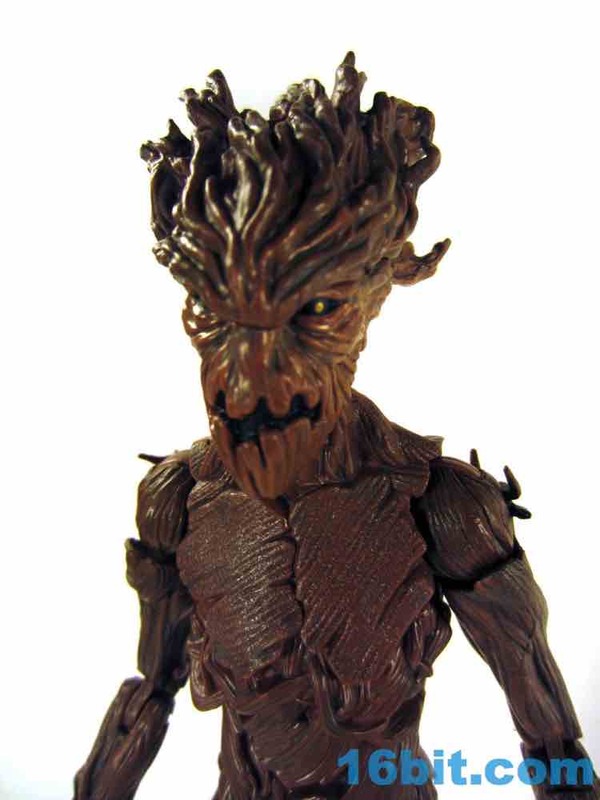 The head sculpt is good - kind of creepy, with an open, jack-o-lantern of a mouth with black paint helping to shade in some depth in his smile. 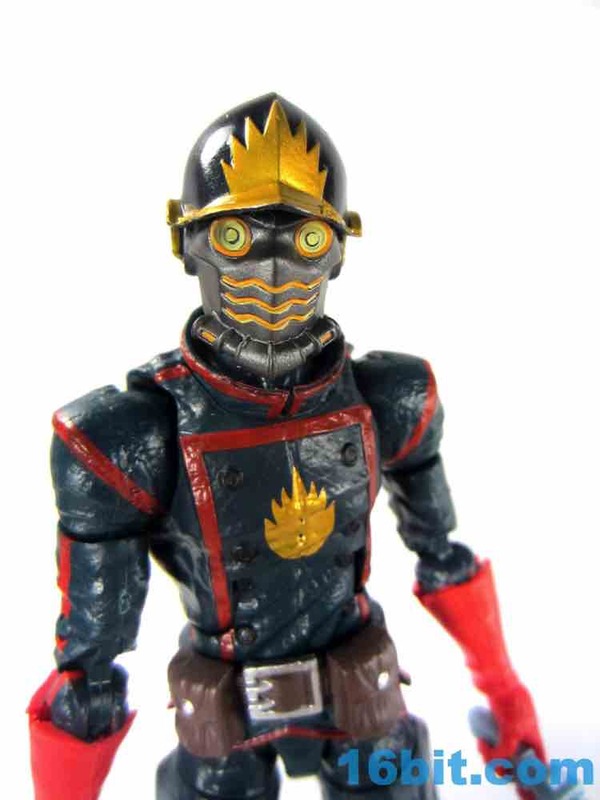 Each eye is black with a metallic gold dot, not quite the same as the "glowing" look on the box art but still quite nice. The head really makes it, and it's quite the contrast from the "gentle giant" persona of the movie toy (who stabs a bunch of dudes). 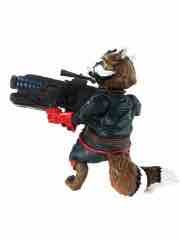 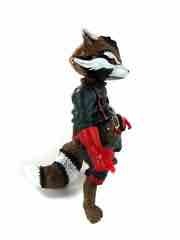 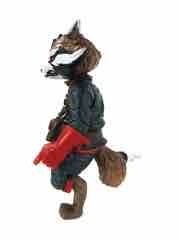 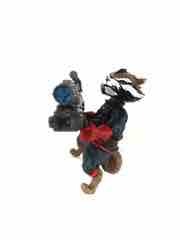 If Rocket Raccoon looks familiar, he should - this is the build-a-figure that was commanding a high premium a few years ago, but with a new head sculpt and new deco. 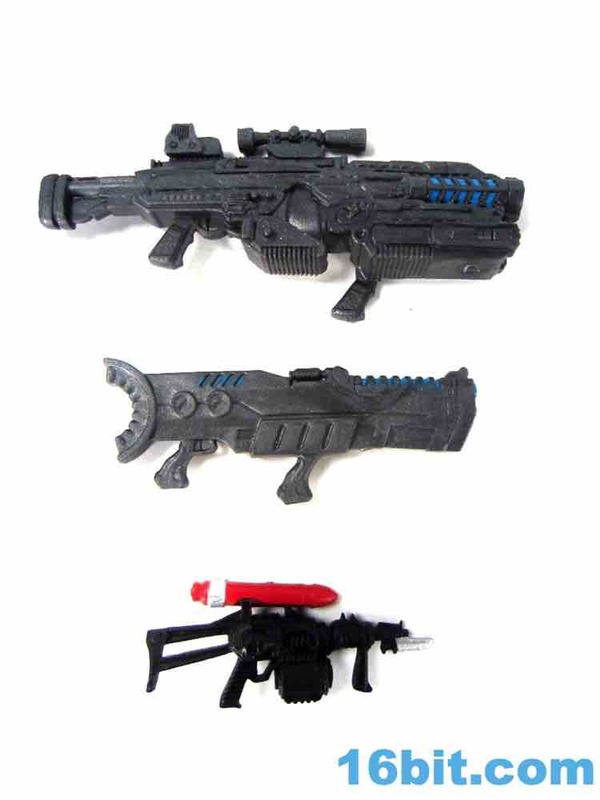 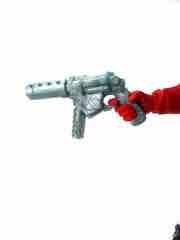 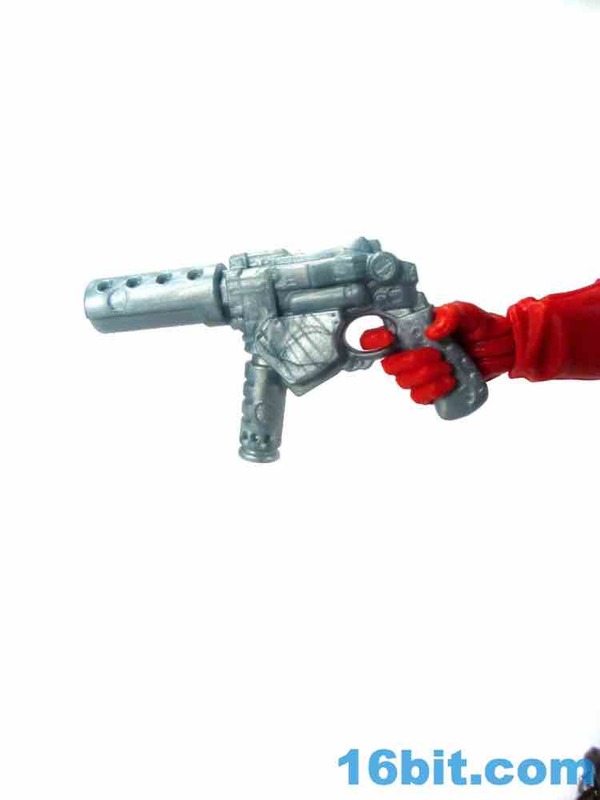 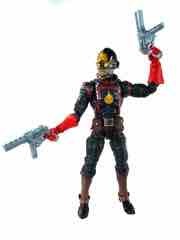 Also, bonus guns - in addition to his usual blaster, Hasbro tossed in a couple of extra gargantuan guns for him to use. 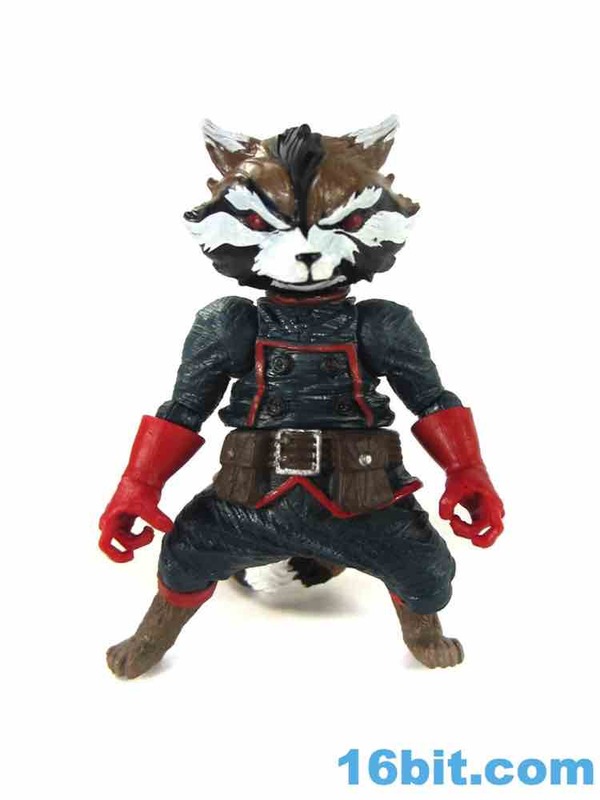 The face is a little smoother, with less black around his now red eyes. 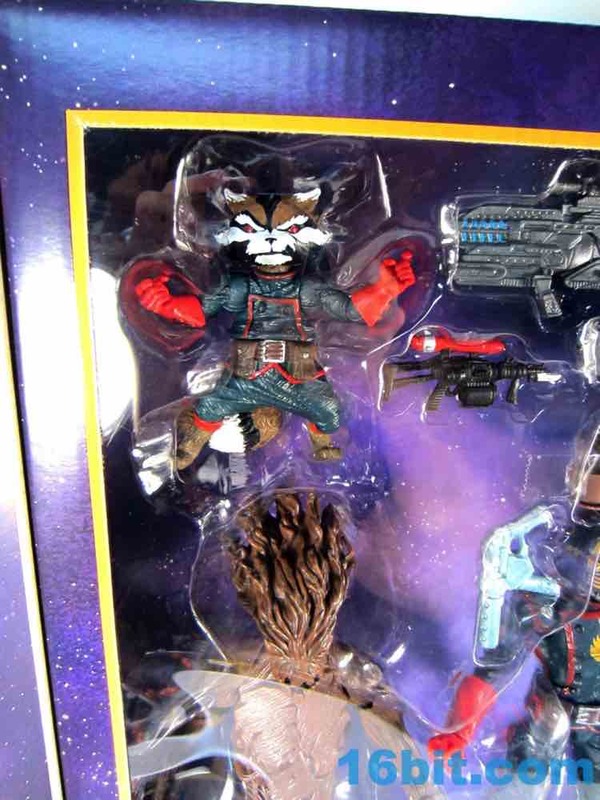 There is a little more trim on his costume, and his buttons are different colors. 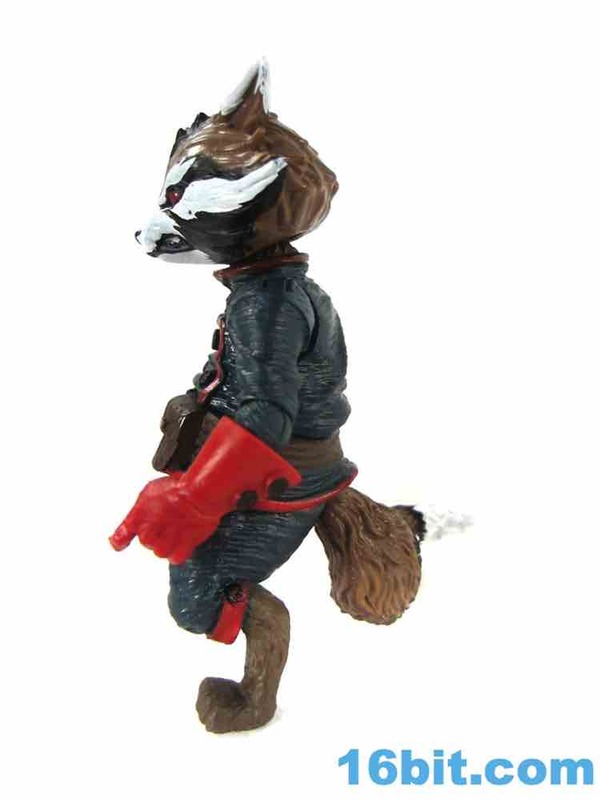 The original release had no white on his tail, and this one does - so it should be pretty easy to tell the original from this boxed set version. Articulation remains limited, with one joint for the waist and nothing for the legs - mine had some warped legs which require correction. 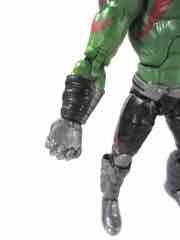 Each arm has a ball-jointed shoulder and elbow, plus a swivel wrist. 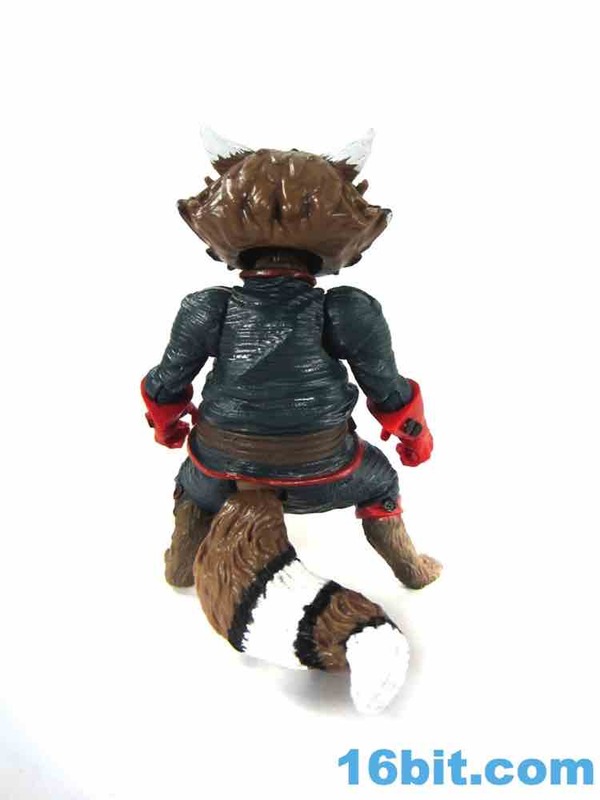 There's also a ball-jointed neck and tail, making this the second simplest figural item in the set after the non-articulated baby Groot. 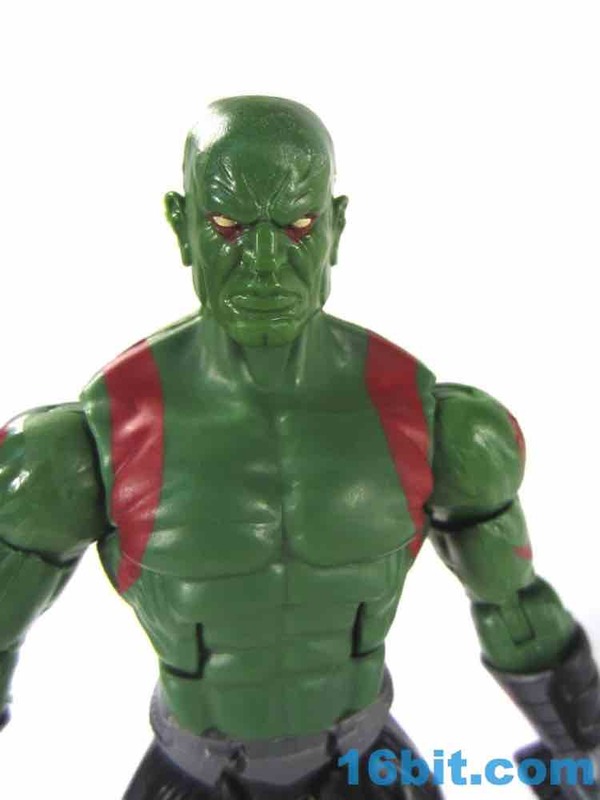 He doesn't look as angry or action-packed thanks to the closed mouth on the head, but it's still a pretty nice figure and if you want the alternate head, you can probably snag one off eBay for ten bucks. 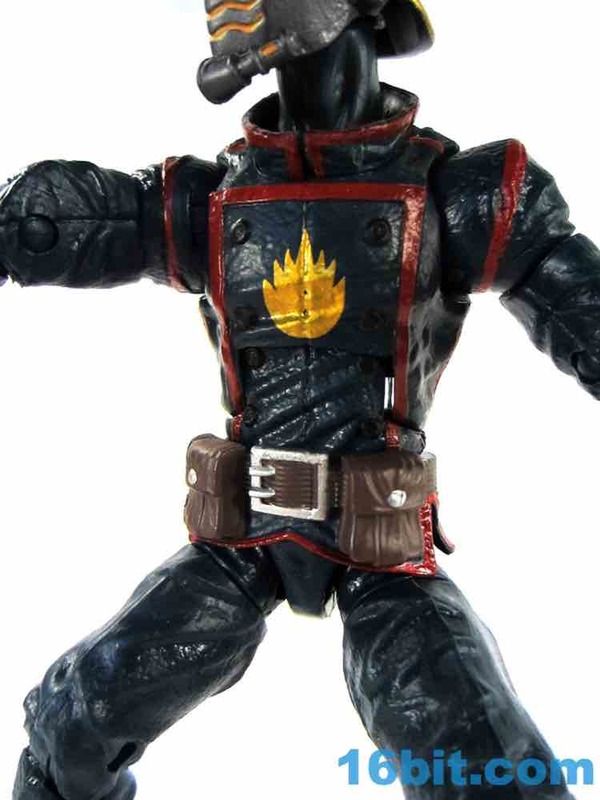 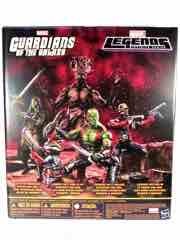 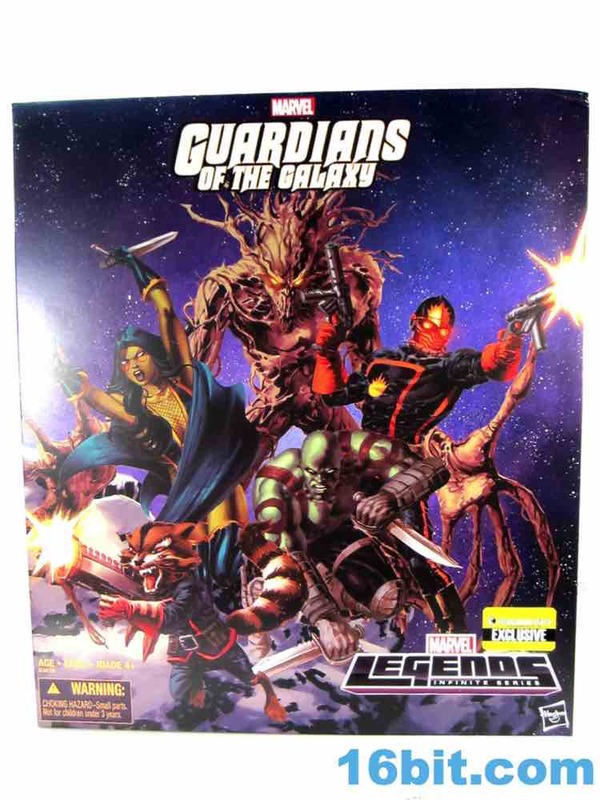 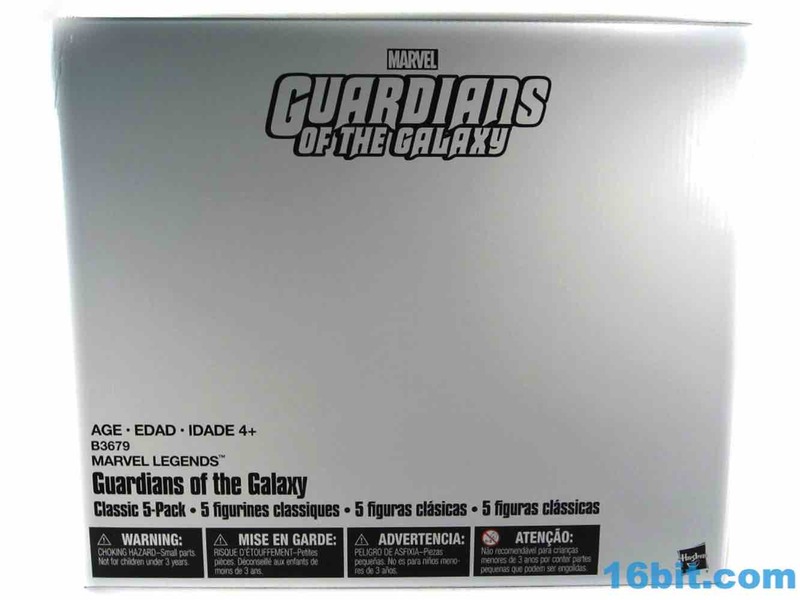 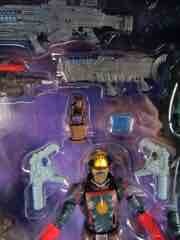 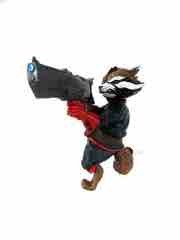 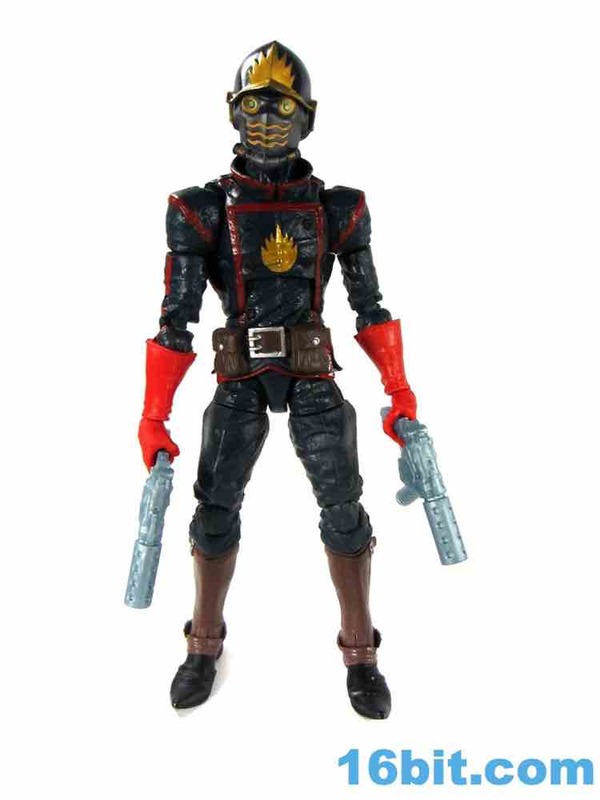 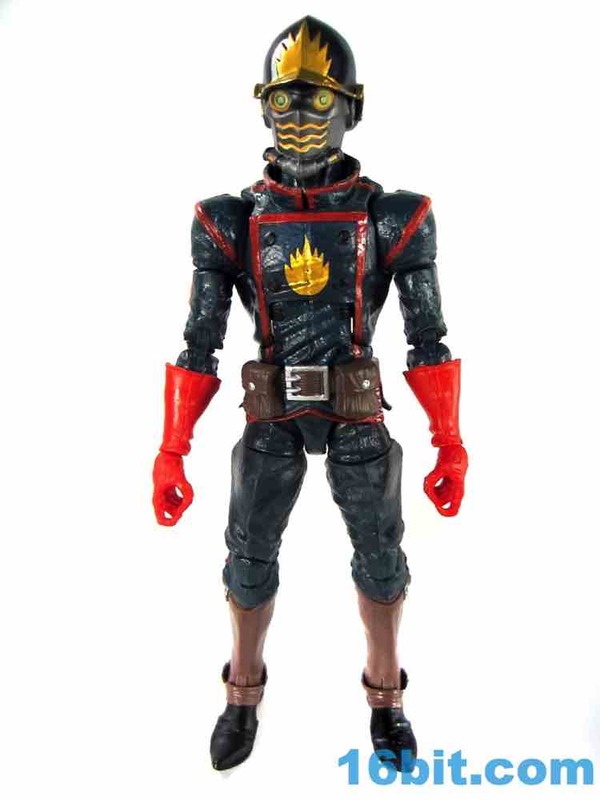 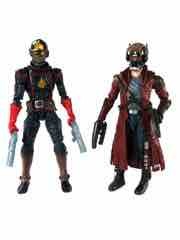 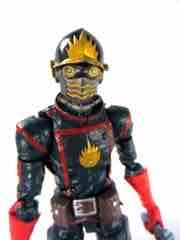 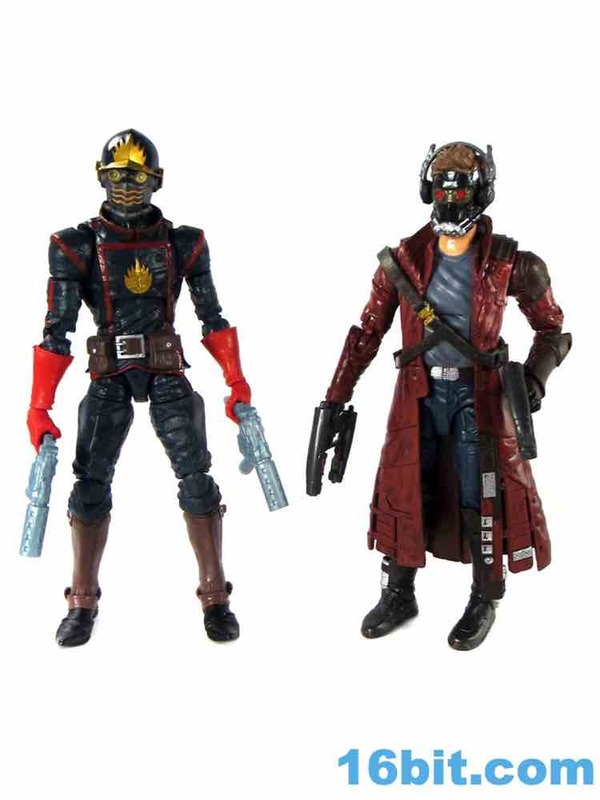 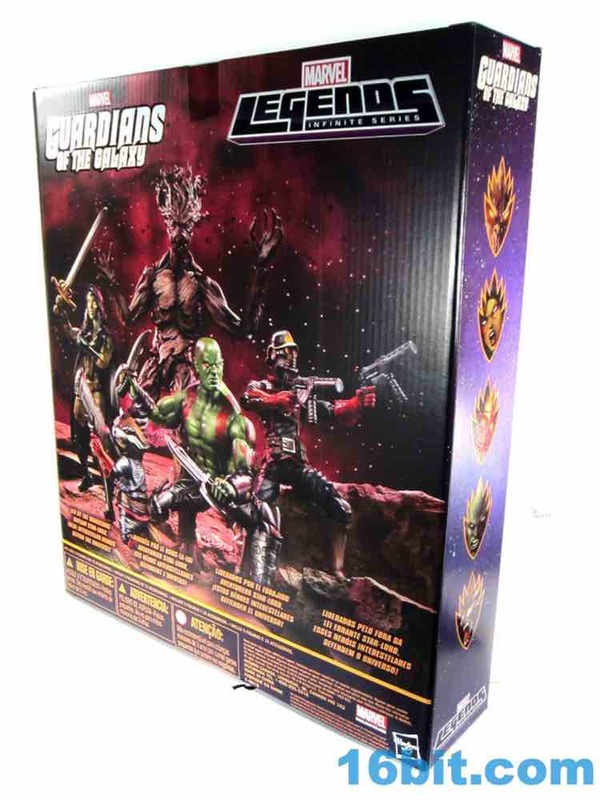 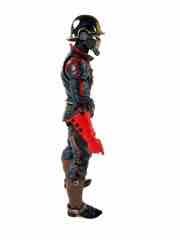 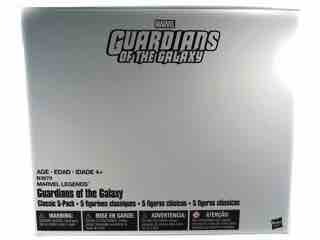 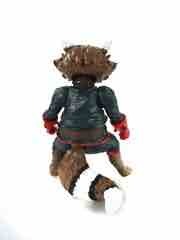 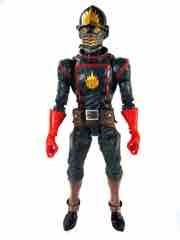 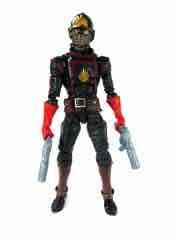 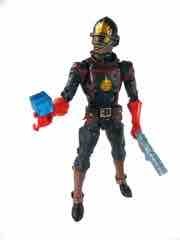 To date 6-inch scale comic Star-Lord has only appeared in exclusives. 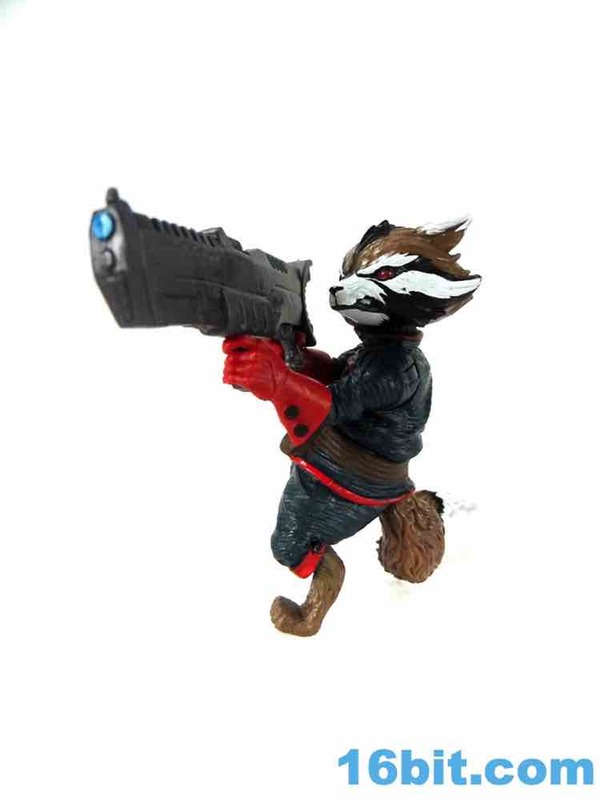 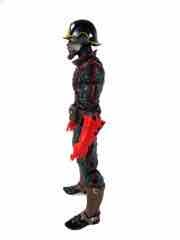 His first figure was as a Comic-Con exclusive and went on sale before anybody saw the movie, thus making it an item of considerable interest. 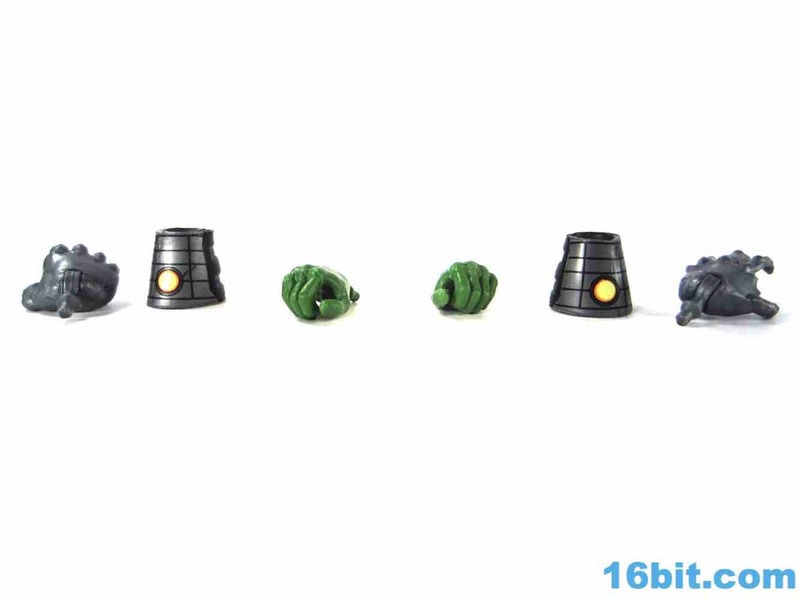 Actually, this set is a cheaper way of getting most of these guys if you weren't already all-in. 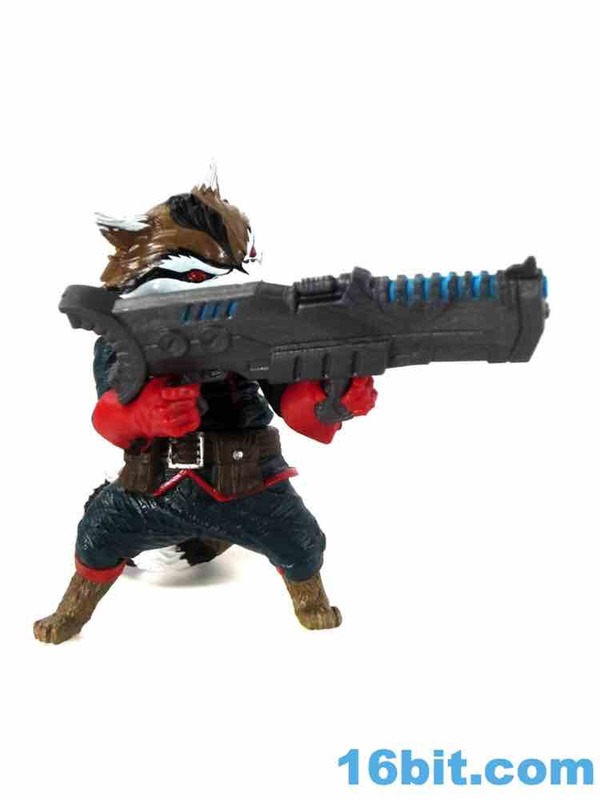 His guns are a little lighter and bluer, and the figure itself has had some hue shifts. 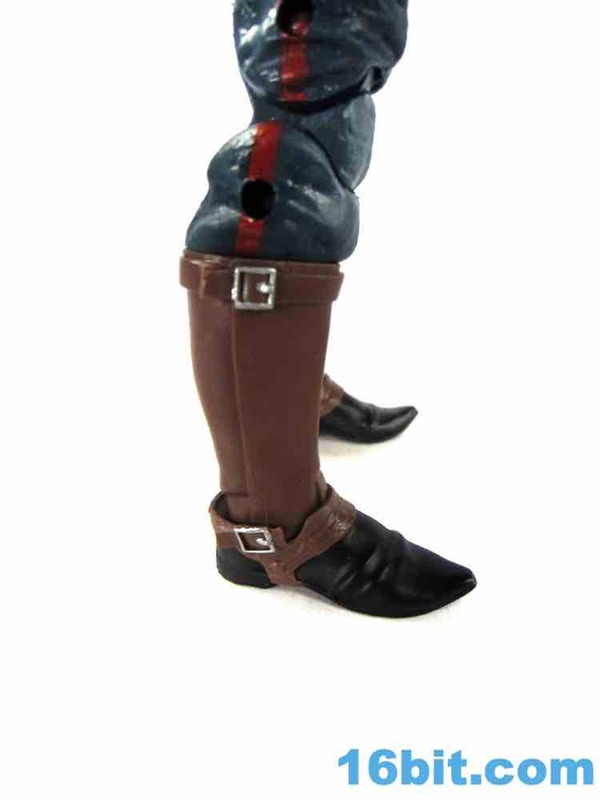 His belt and boots are now mostly brown, as opposed to black, and the body seems to be a smidgen lighter in the blue department. (I don't have a Thanos Imperative version to compare.) 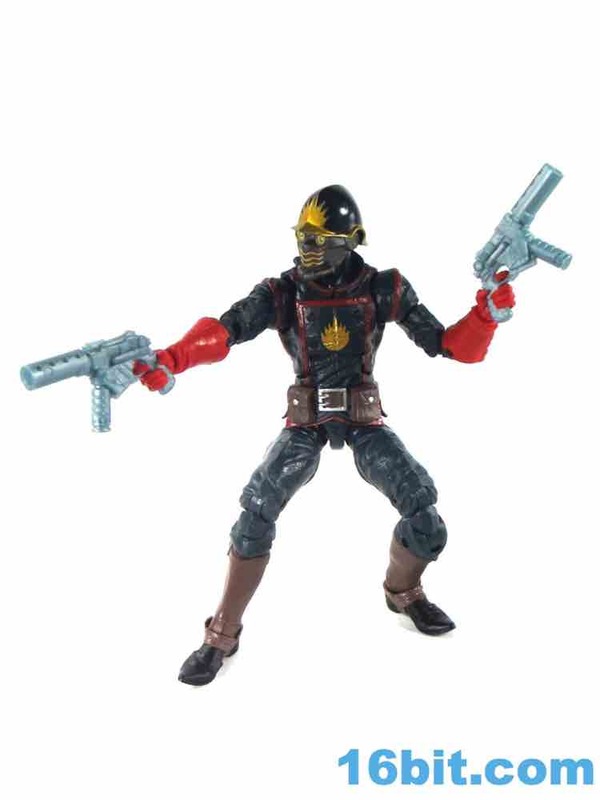 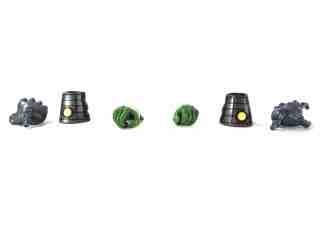 The figure shared a body with the AIM Soldier, so you'll no doubt recognize the bend-and-swivel wrists from that yellow release. 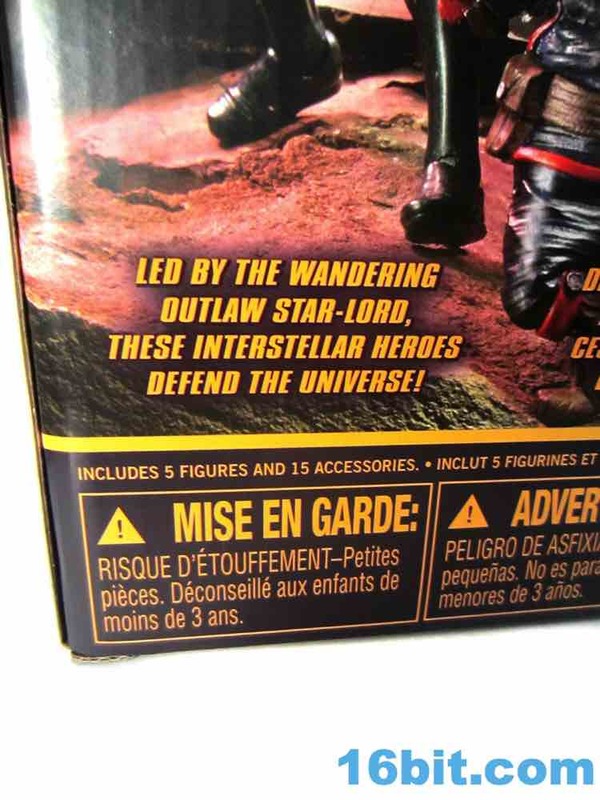 Star-Lord has around 25 points of articulation, depending on how you feel like counting - double-knees, double-elbows, and rocker ankles don't mean the same thing to all people. 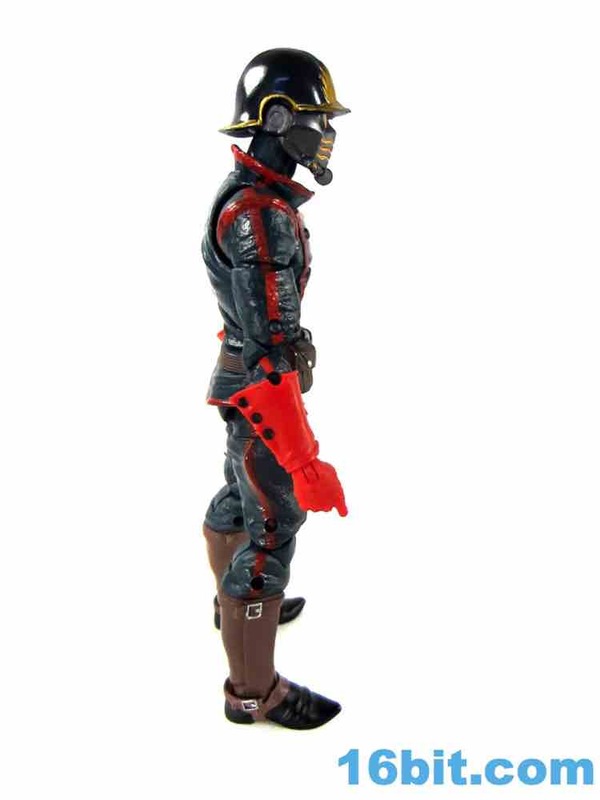 He's one of the best, is what I'm getting at here. With no new tooling, it's worth noting the textures are good and the paint applications are largely clean and solid. 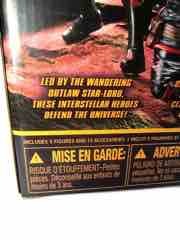 Metallic gold "Ravager" symbols are nice, and so is the bright orange on his face mask. 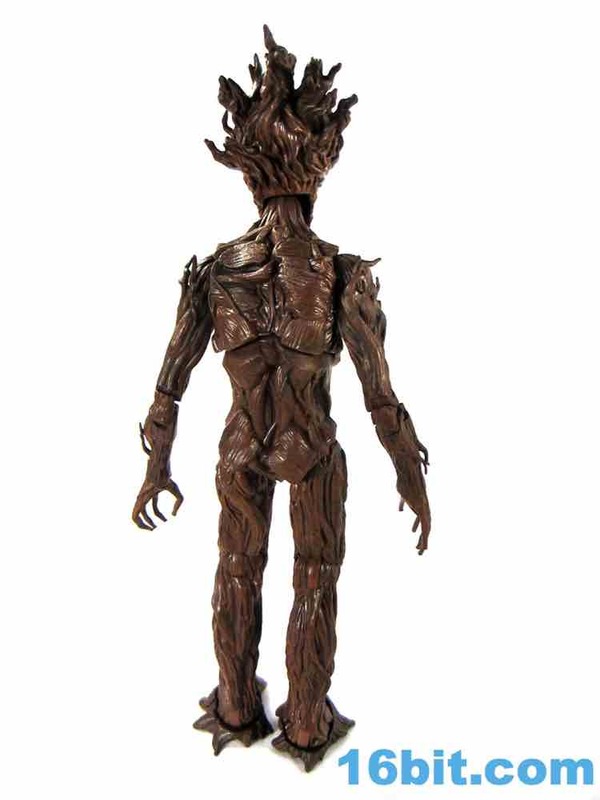 I also assume most people will not care so much as the character's look is arguably now the movie version, and showing this to people who only saw the movie will say "....who is that?" 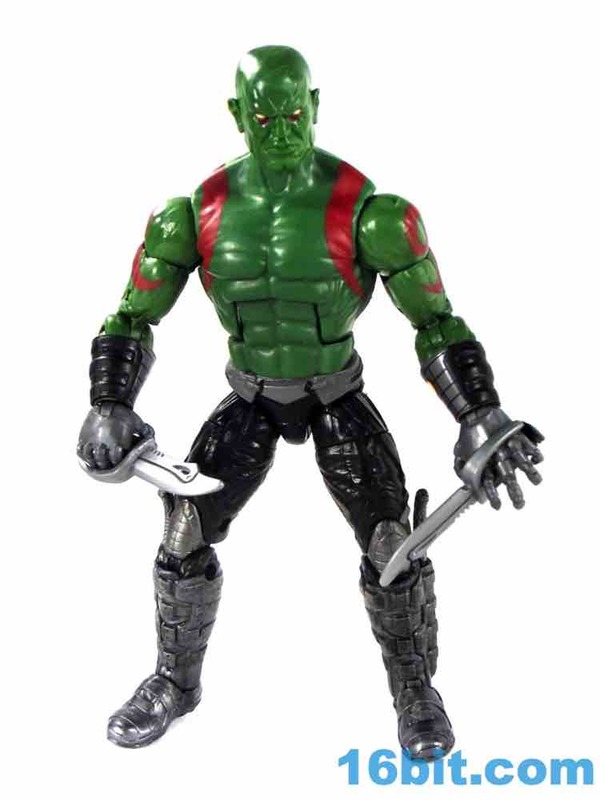 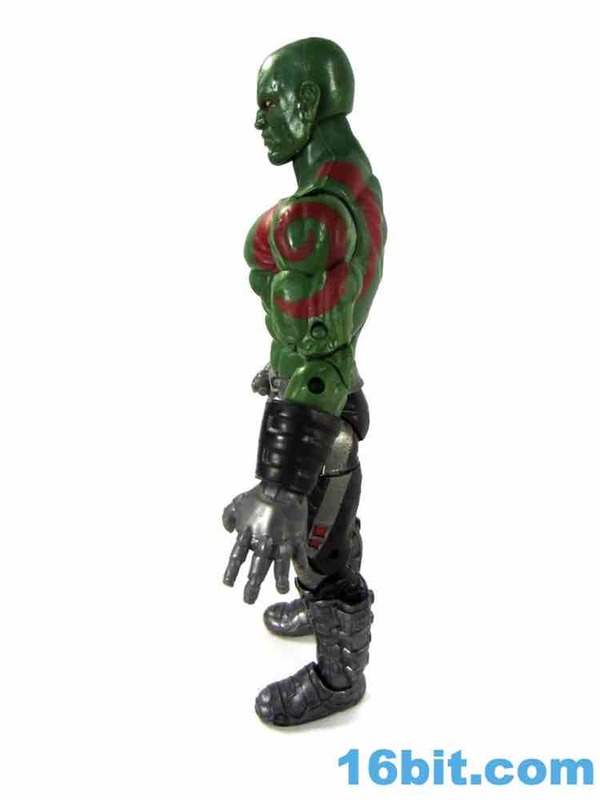 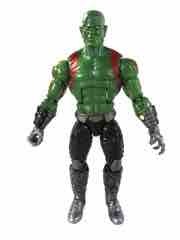 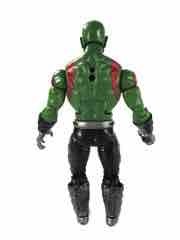 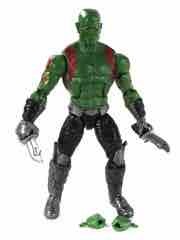 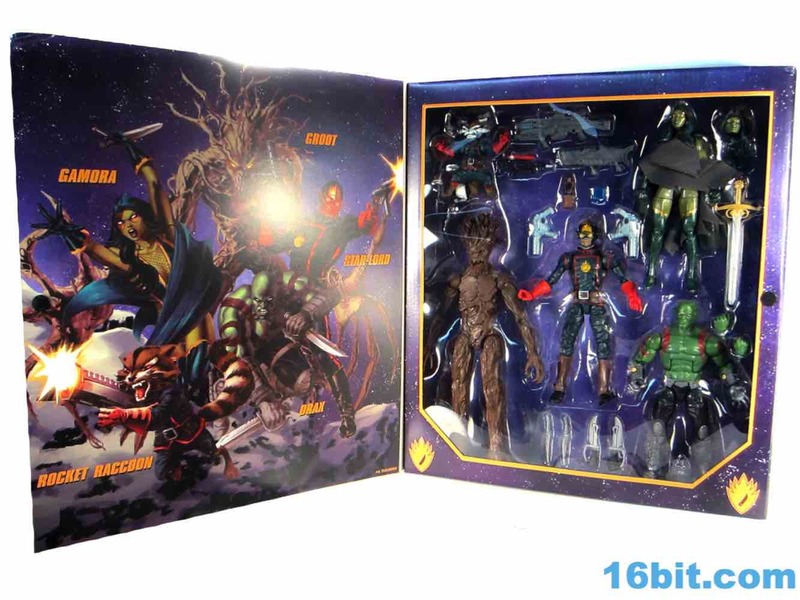 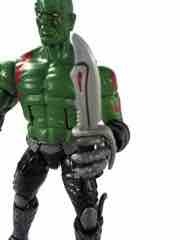 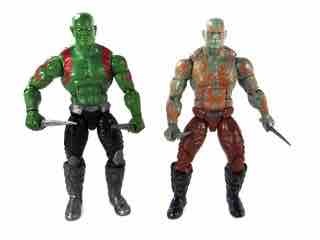 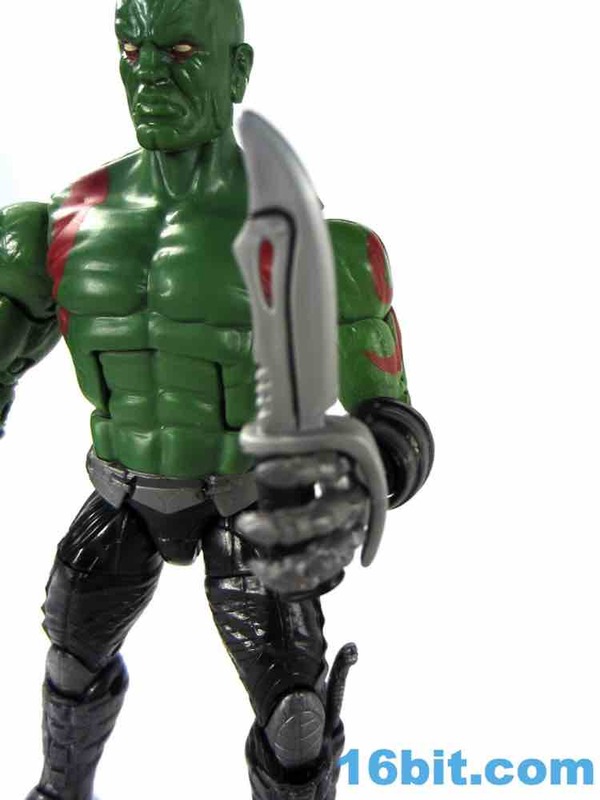 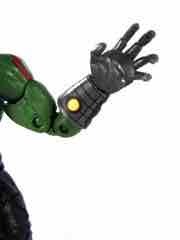 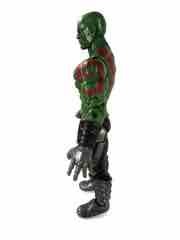 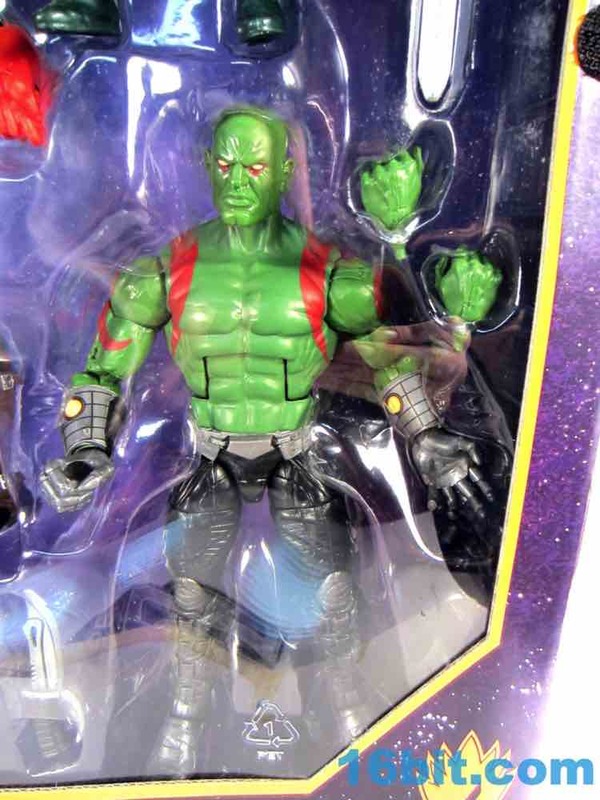 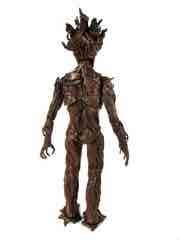 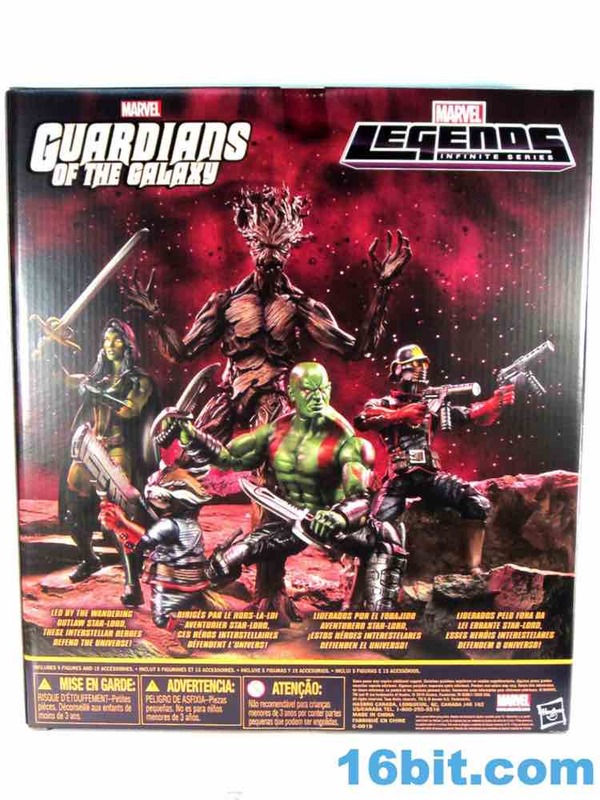 Interestingly, Drax was previously sold as a regular figure, with a different body. 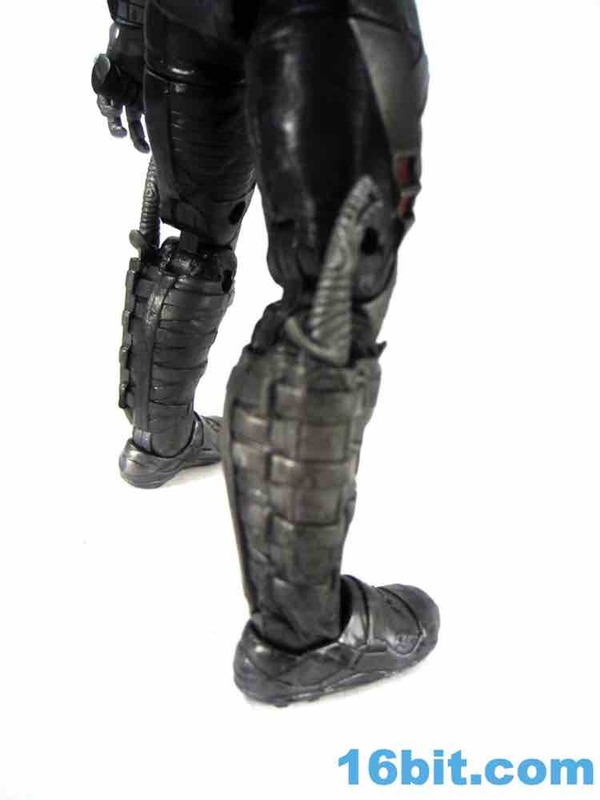 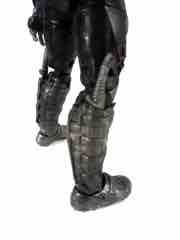 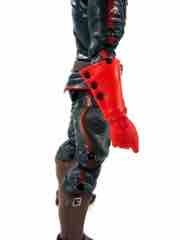 His legs and pants are reused from the movie version, and the other parts come from elsewhere. 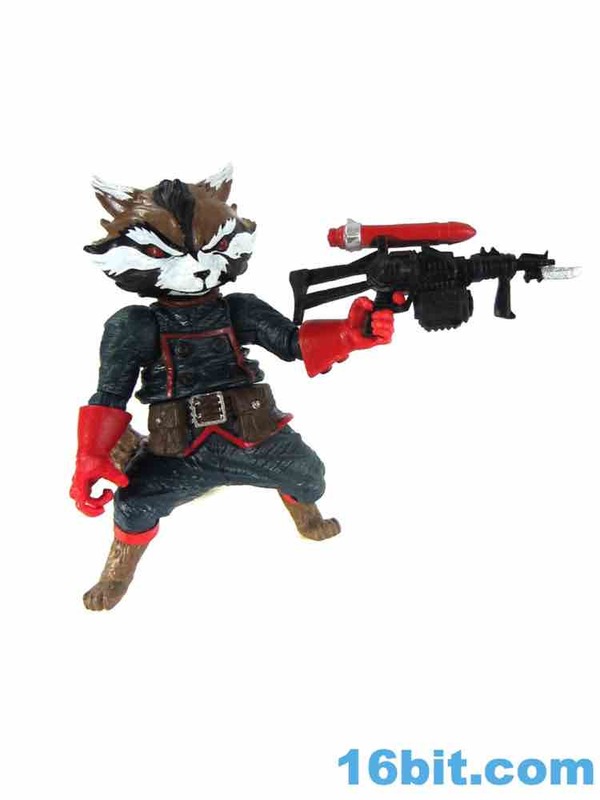 The red markings are painted, not sculpted, and he's a lot beefier than the poorly-selling clearance bait comic version from a few years ago. 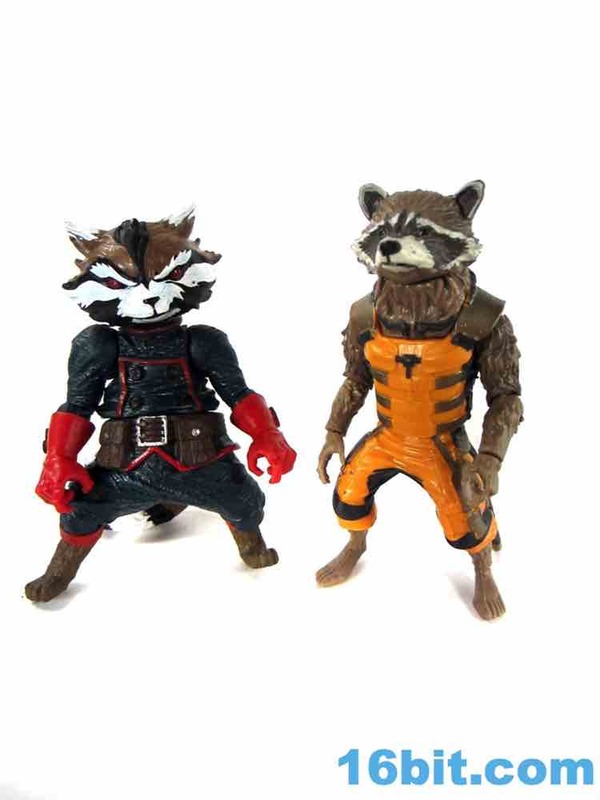 Amazon had them at $6, Toys R Us offered them for quite some time at full price with a complimentary dusting of whatever particles were circulating throughout their air ducts. 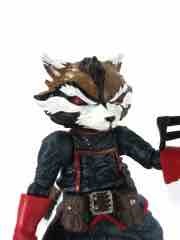 This one is better, and he comes with options. 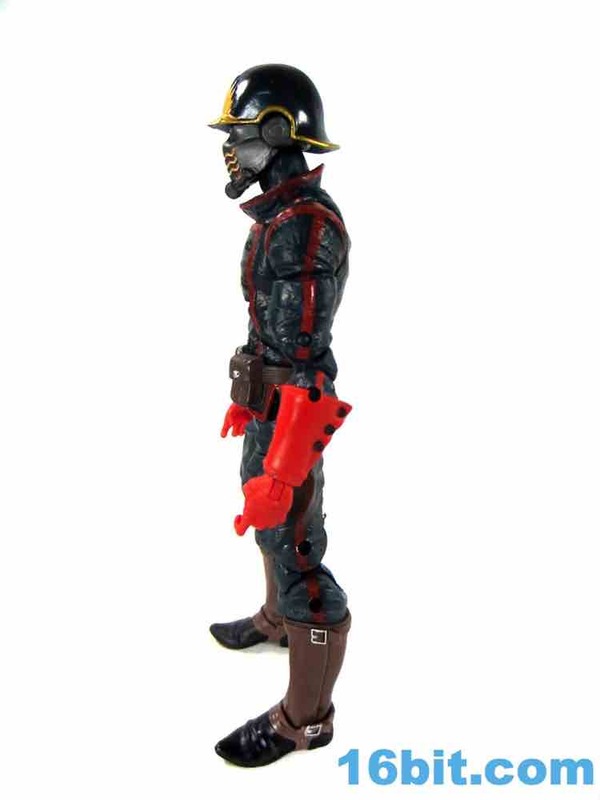 Not only does he have basically the same level of articulation as Star-Lord and working holsters for a pair of his smaller blades (also from the movie), but he has swappable hands and removable gauntlets. 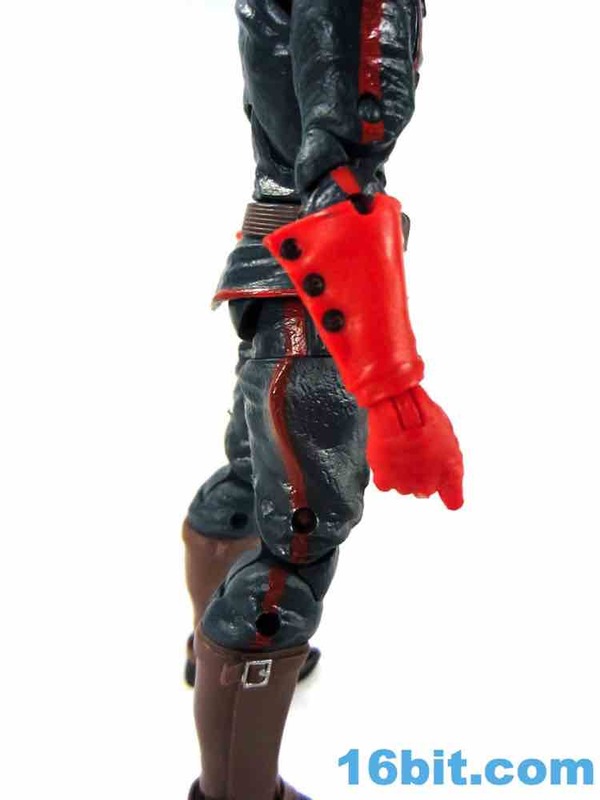 You can choose if you want gloves or no gloves, which is actually pretty fantastic. Granted, I don't need this feature. 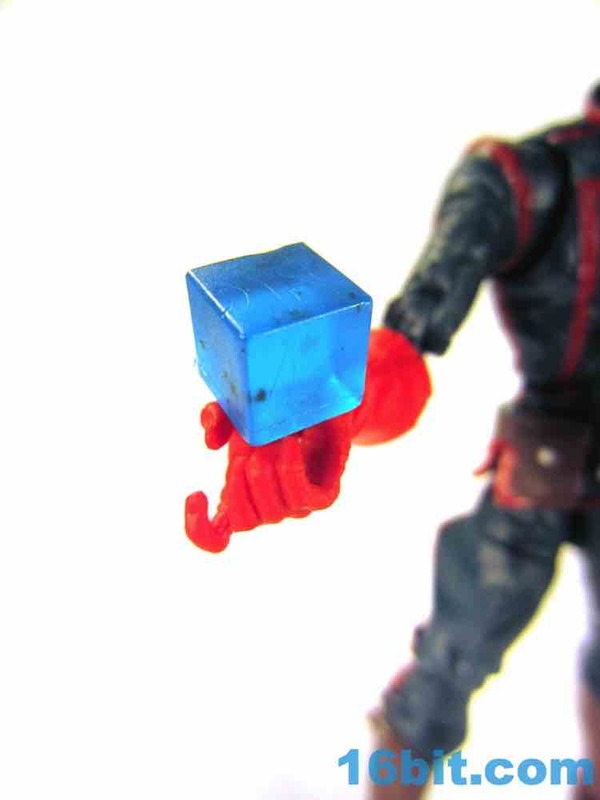 It does nothing for me, personally - but it's there if you need it. 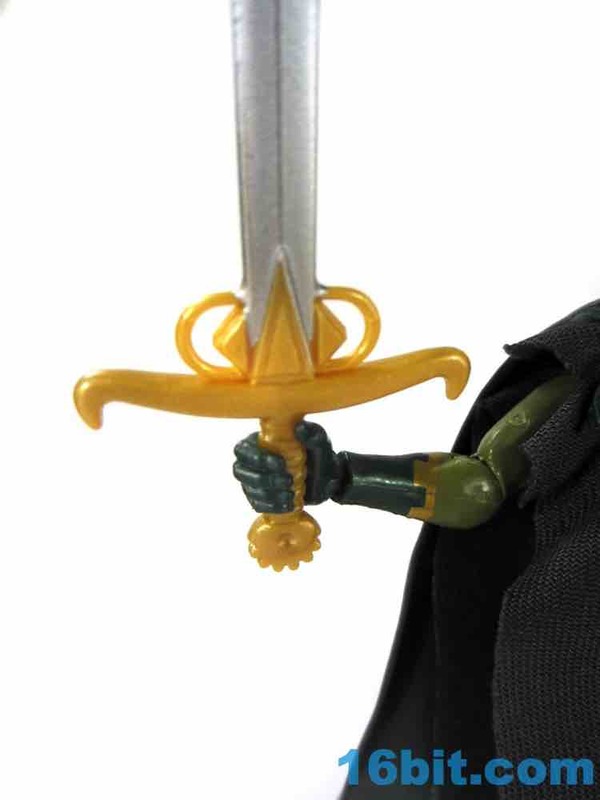 The silver hands have no problems holding the big blades with their guards, so it was helpful of Hasbro to give you four knives to arm this figure up nicely. 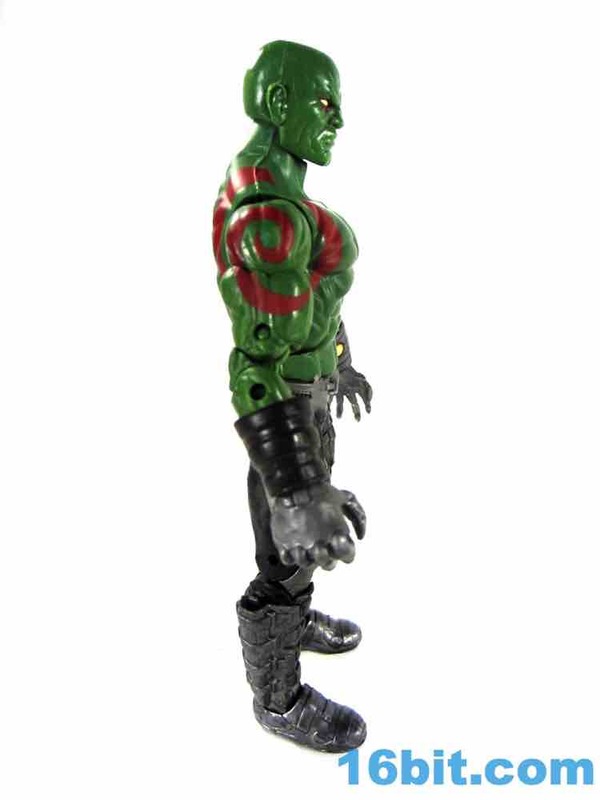 He's a big guy with a big build, standing a hair under 7-inches tall at his hairless head. 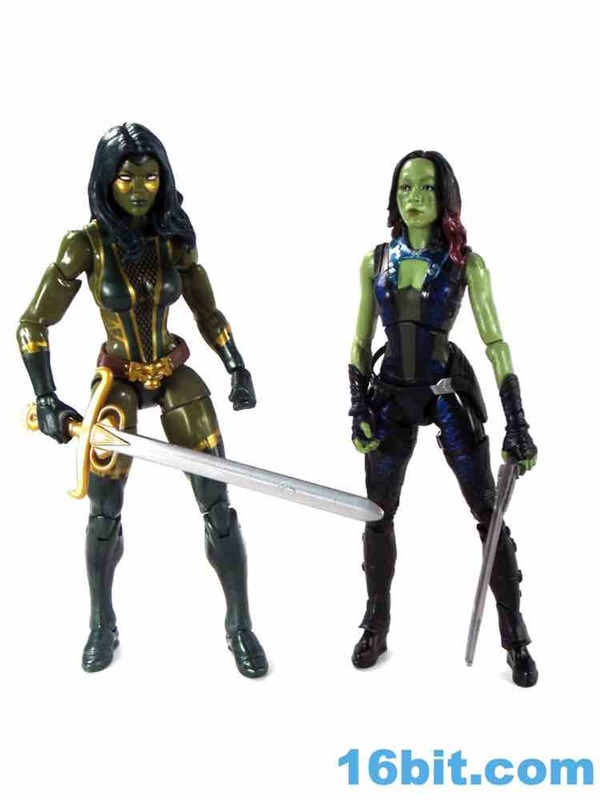 Rounding out the set is a Gamora with options. 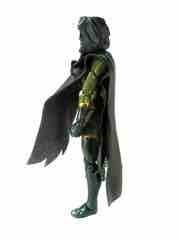 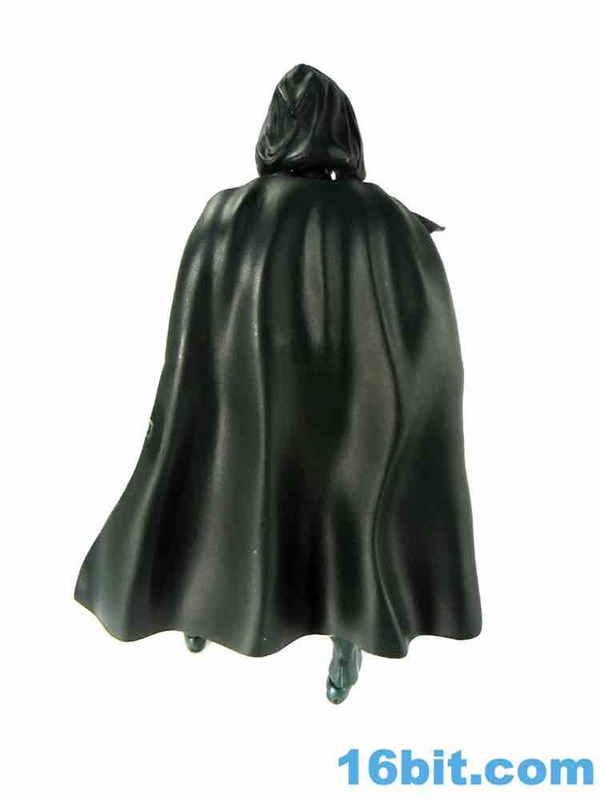 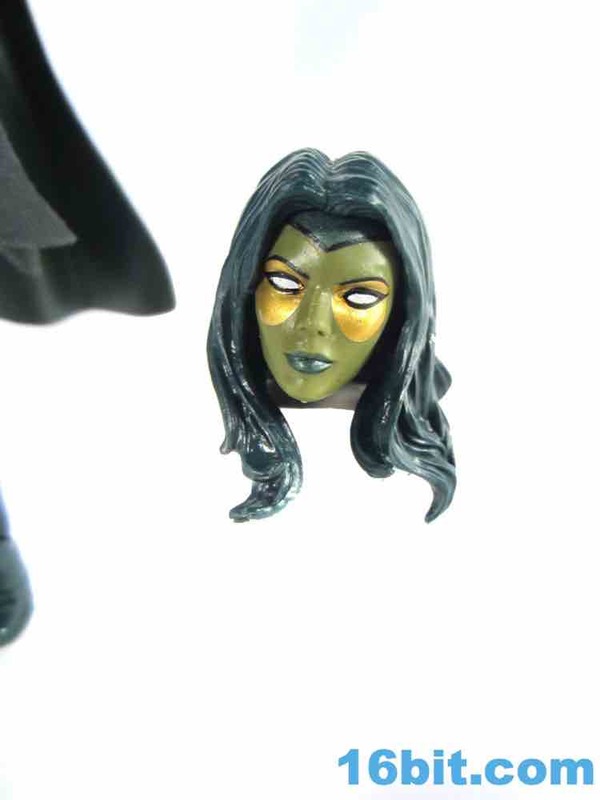 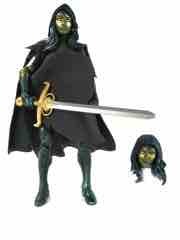 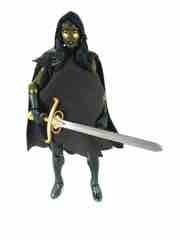 She has two different heads - one has an open mouth and a hood, which ties in to the plastic cape. 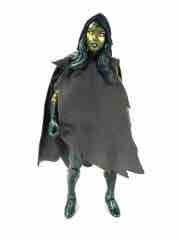 She also has a cloth poncho and a hoodless, closed-mouth head. 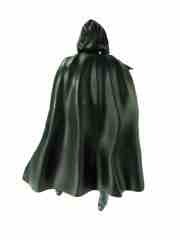 Under the cloth cloak, complete with faux tattering, is a body with painted up mesh and what could arguably be exposed skin. 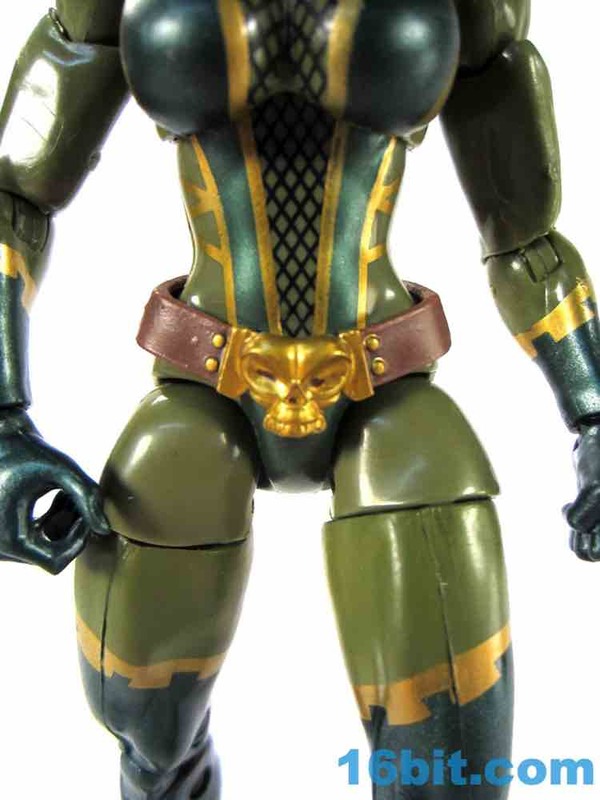 She has a nifty sculpted belt, plus a fair amount of gold trim. 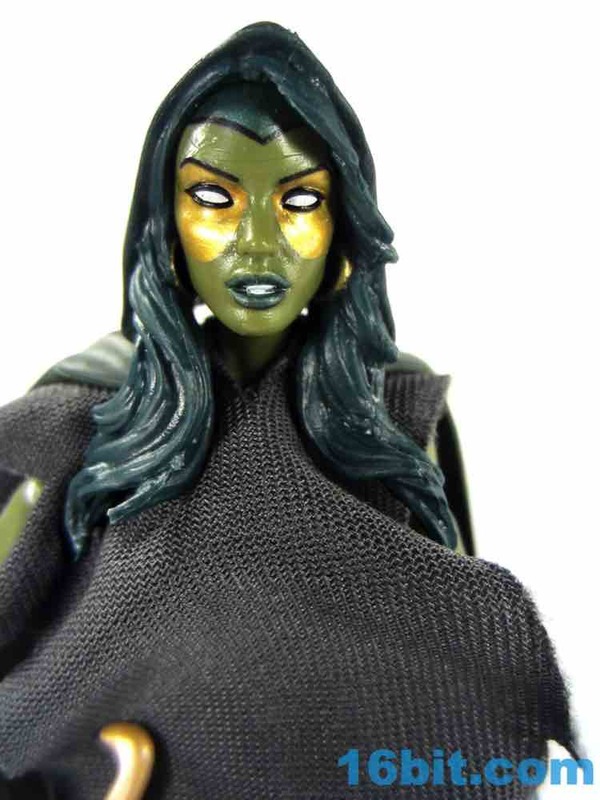 I'm not sure the comic art I saw had the mesh, though. 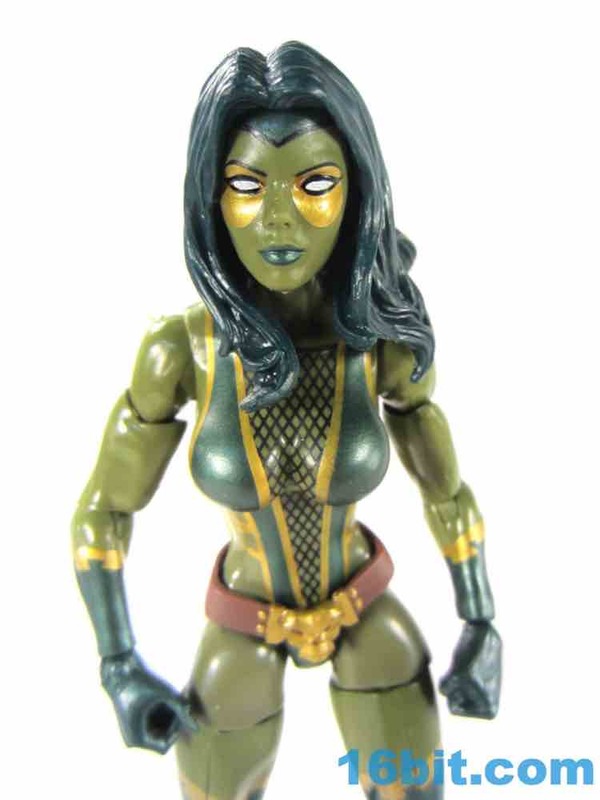 There's not a lot of variety in the bodies of women in Marvel Legends, so the one-size-fits-many approach tends to work when you add new heads, paint, and accessories to the same relatively skinny body. 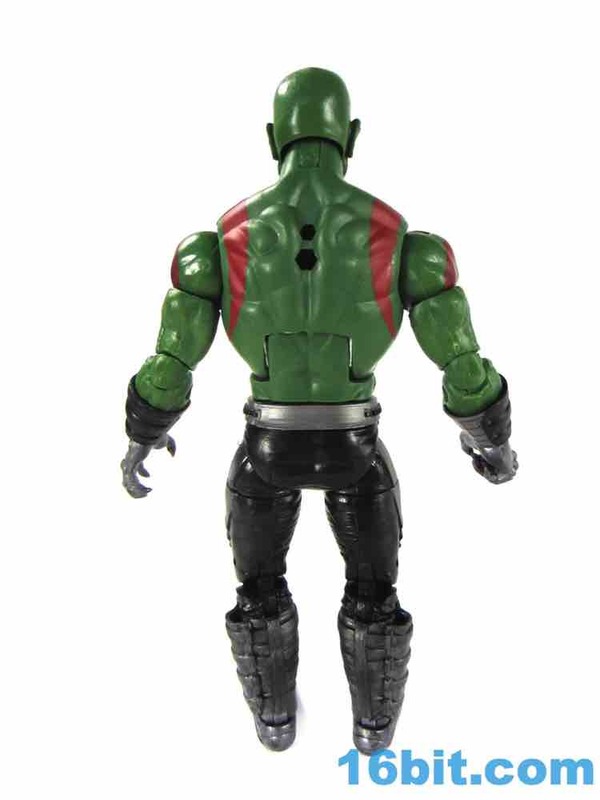 The comics are often the same way - one basic body could be the basis for hundreds of characters in most superhero stories. The face has a nice sculpt with gold make-up and green lips. 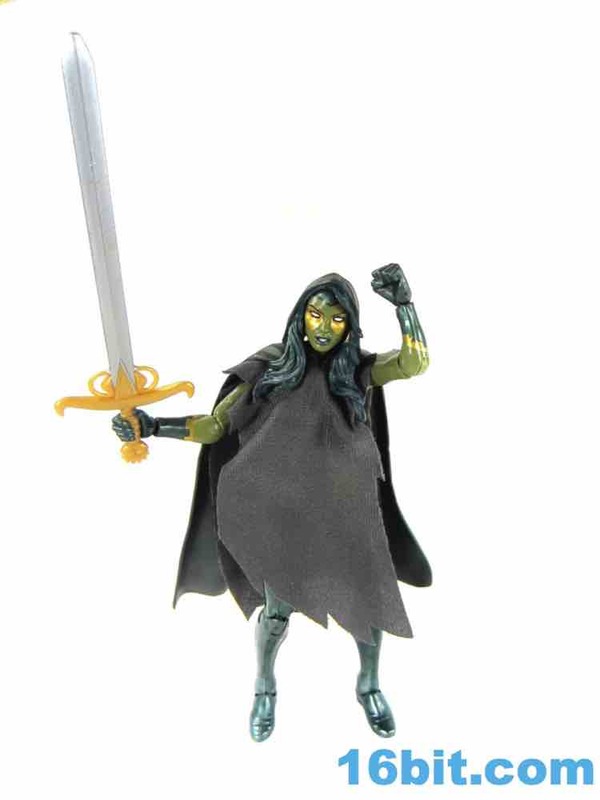 Her left hand is a fist, while the right hand can hold a nifty sword. 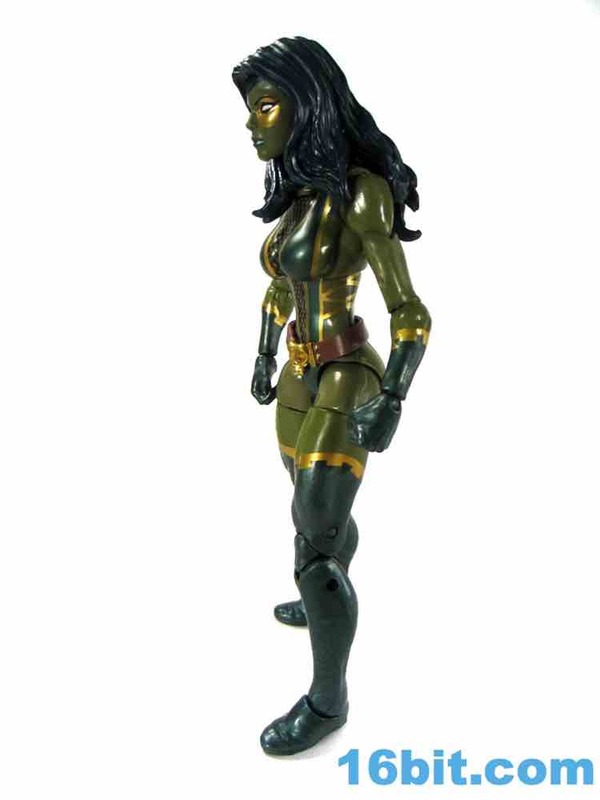 There's not a lot to dislike here, as she has rocker ankles plus the crowd-pleasing bend-and-swivel wrists. 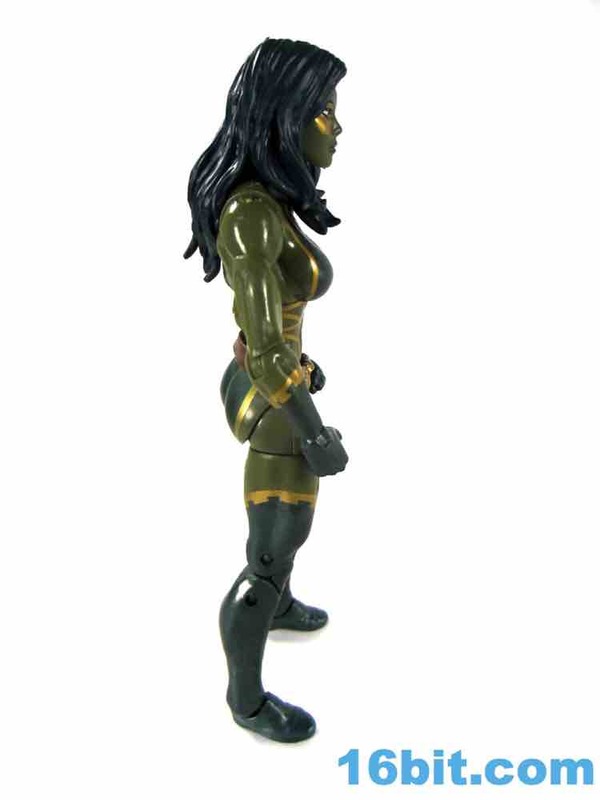 She also has the inset ball joint elbows which some people don't care for as much, but it's not like the figure's armature is particularly great. 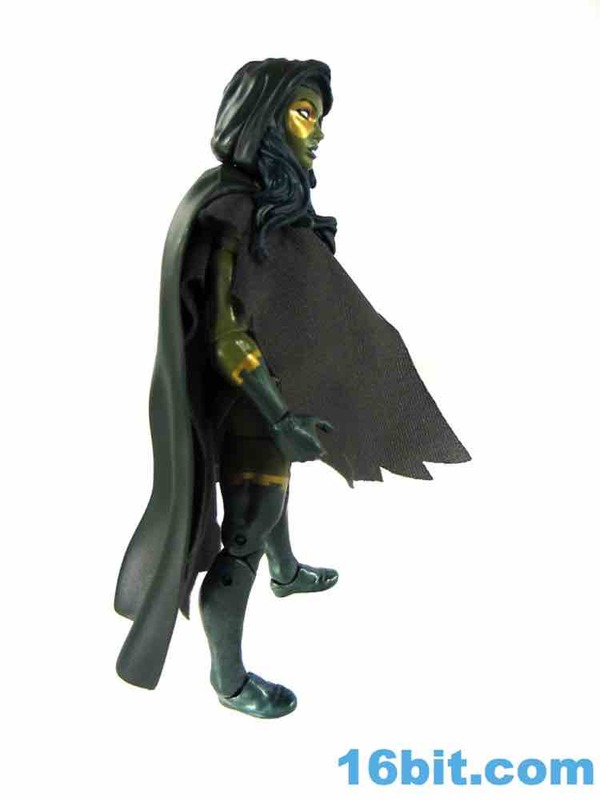 Getting her to stand unassisted takes some time and balancing, unlike the boys in the set who all more or less work right out of the box. She seems to be the big winner from the set, with loose eBay samples already costing 50% or more of the entire set's price. 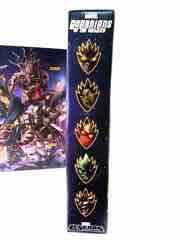 Don't pay it - just buy the whole set. With a blue Cosmic Cube, or Tesseract, or whatever it is, the set comes with a decent amount of gear and has most of it spread out nicely in a big window. 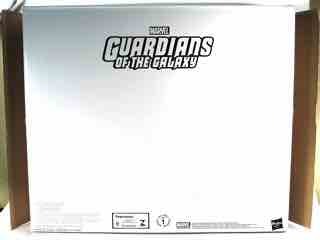 The set comes in a white box, with a fifth-panel window box complete with velcro tab as well. 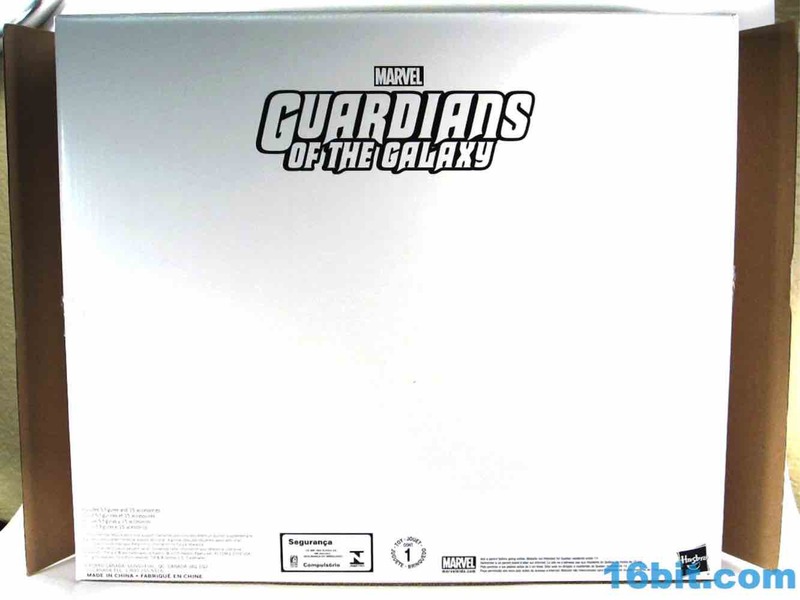 If you see it missing the white box, be angry. 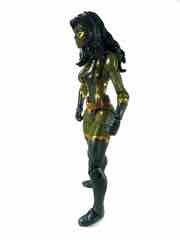 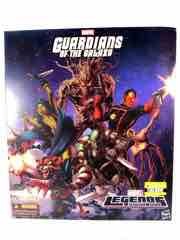 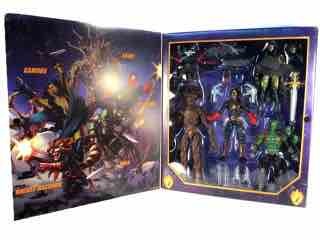 It's Entertainment Earth's first (and so far only) Marvel Legends exclusive and I hope to see more in the future. 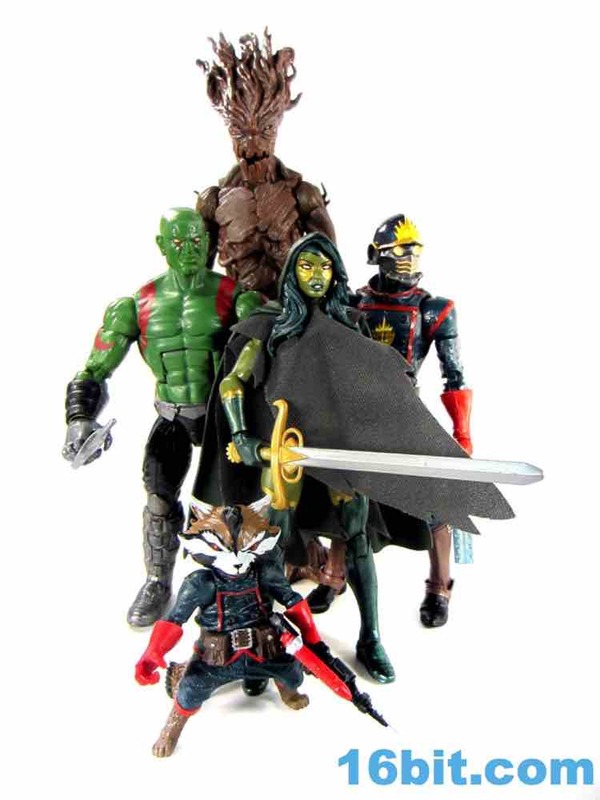 For fans who haven't been buying the line since its inception, it's a good grouping and a way to get a lot of these characters at sub-secondary market prices... although I saw people breaking them down and asking $30 per for Star-Lord, Groot, and Rocket already. 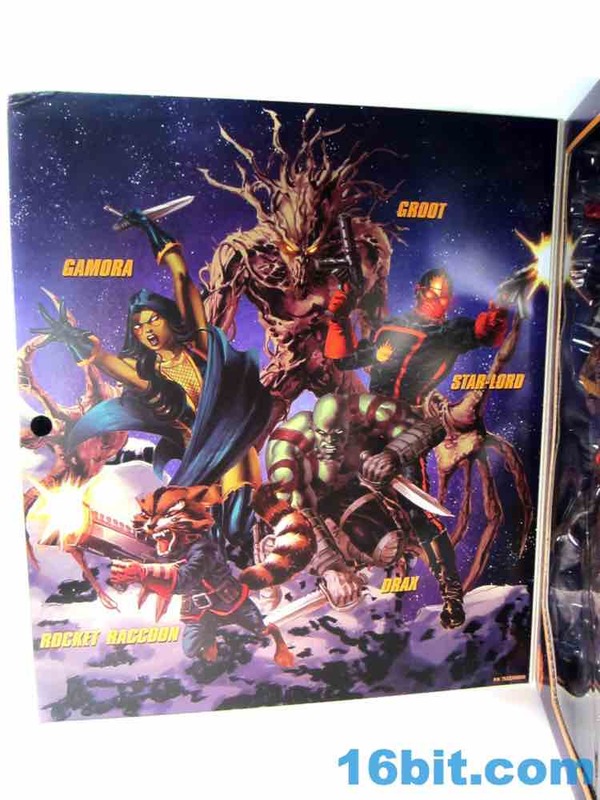 If you want an Adam Warlock, or Agent Venom, or Kitty Pryde, or whoever else you're on your own for now - but as these kinds of groupings go it's a decent one. 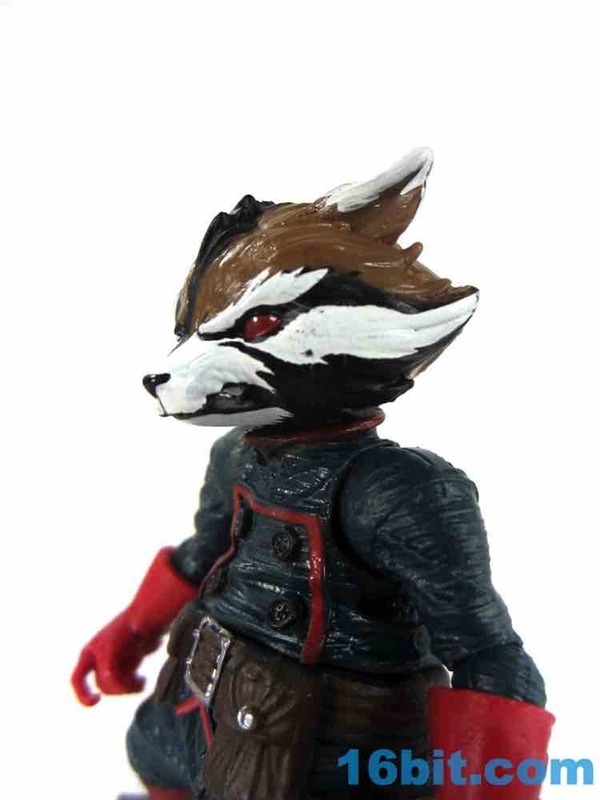 Snag it if you're so inclined, the results are quite nice.